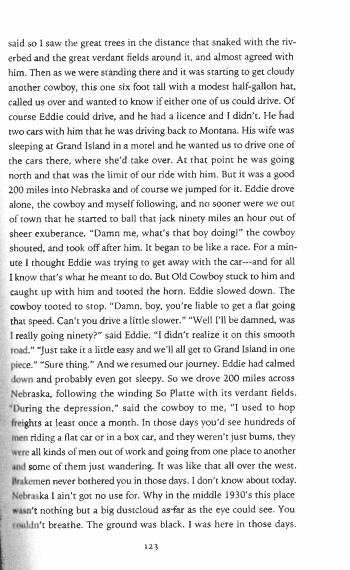 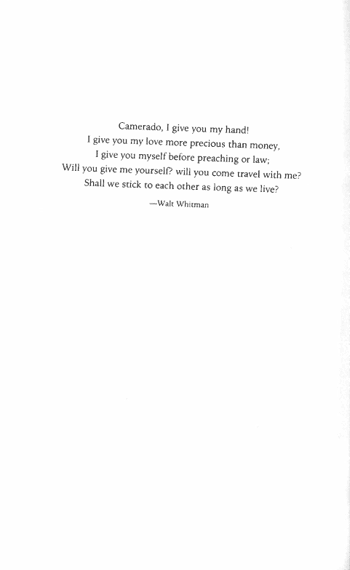 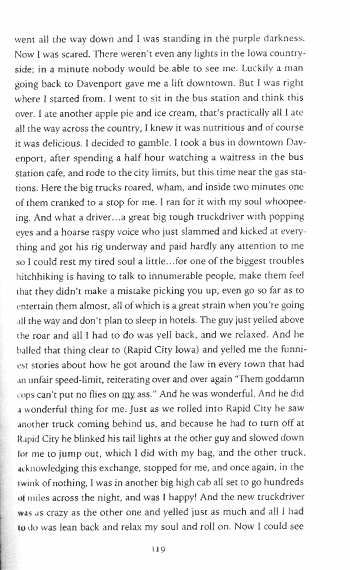 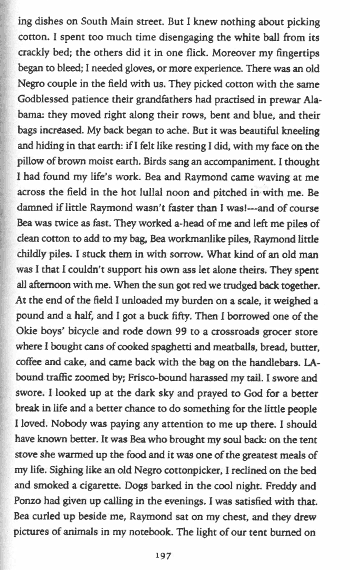 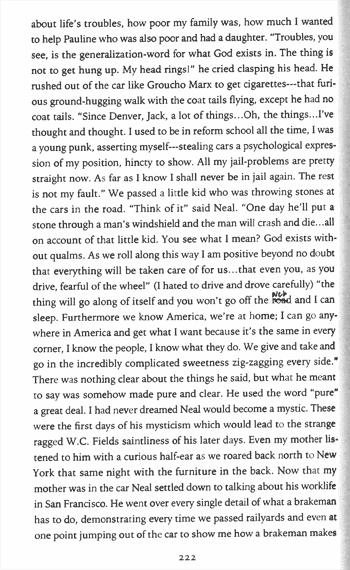 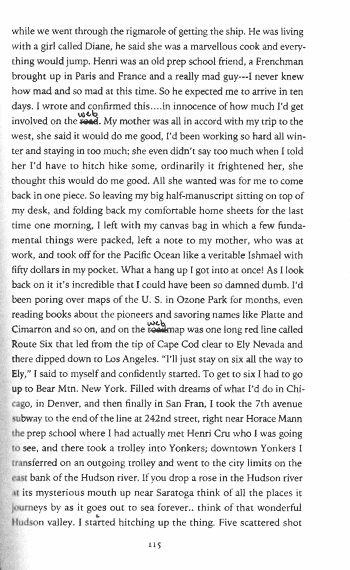 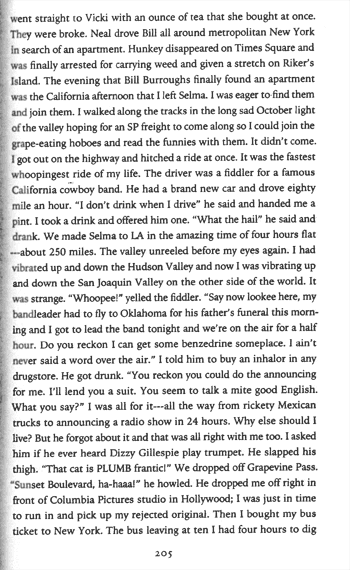 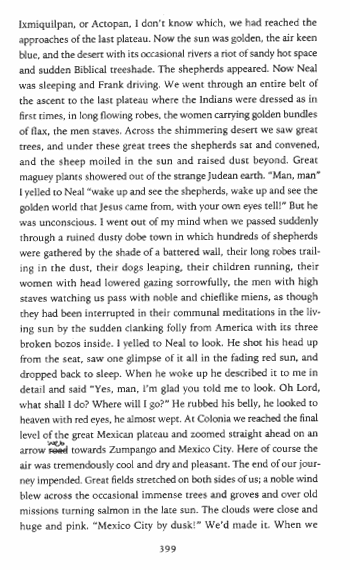 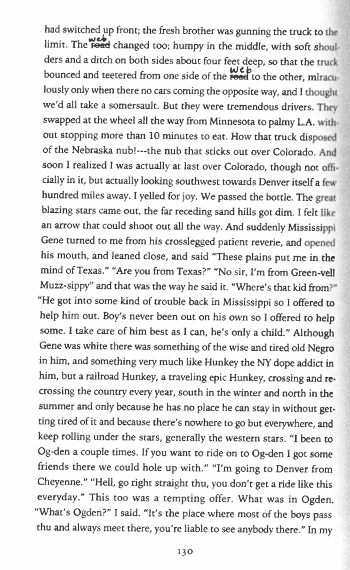 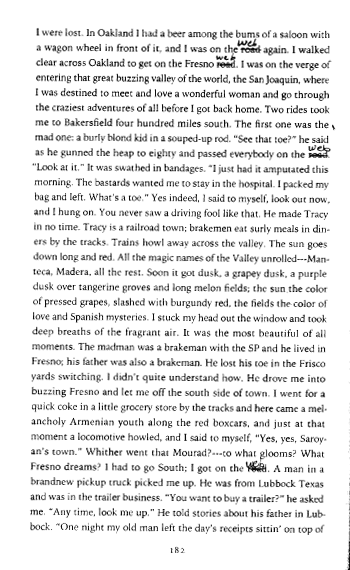 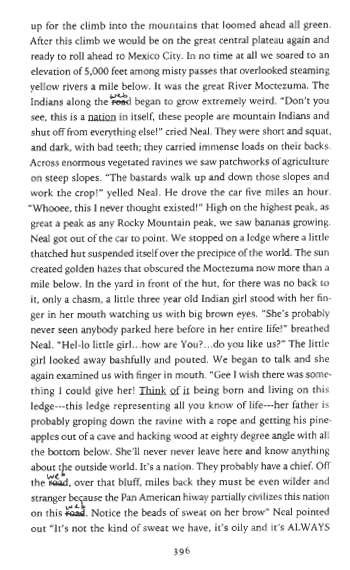 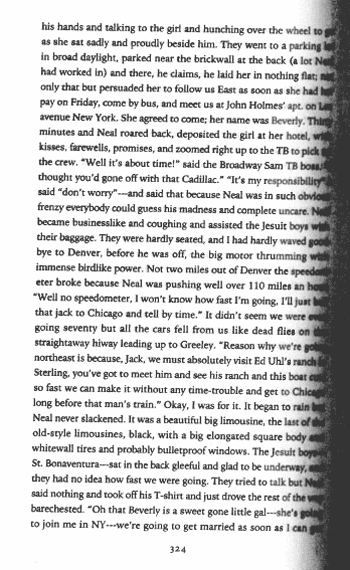 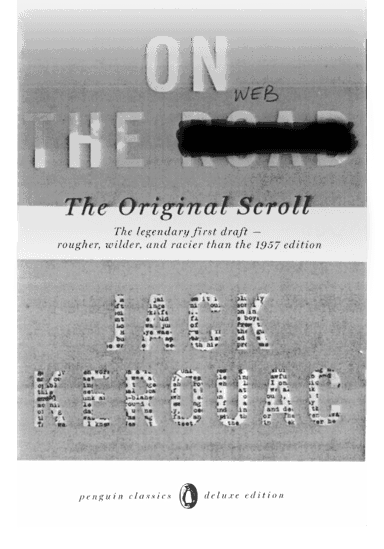 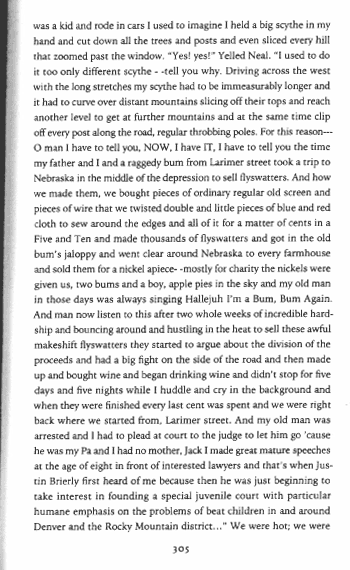 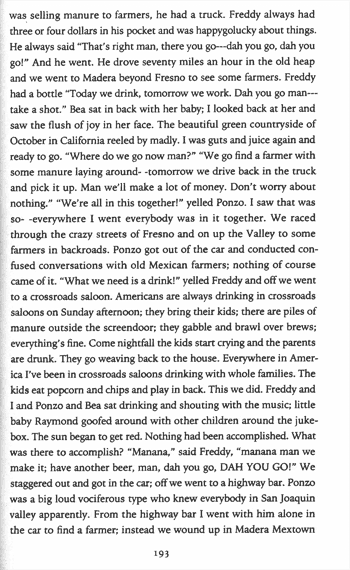 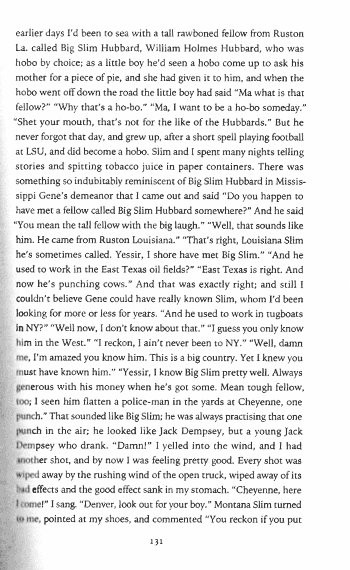 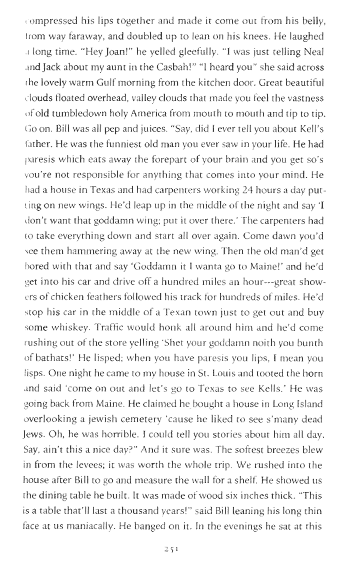 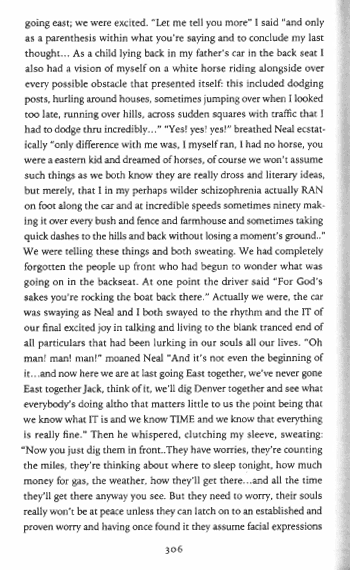 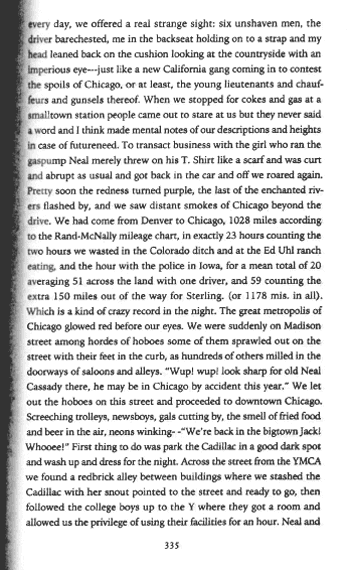 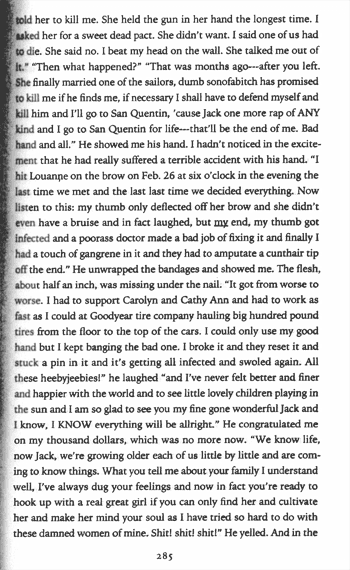 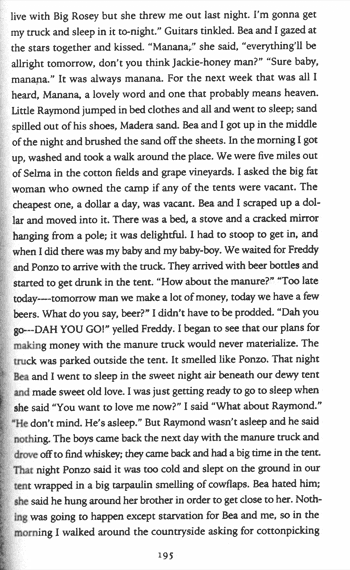 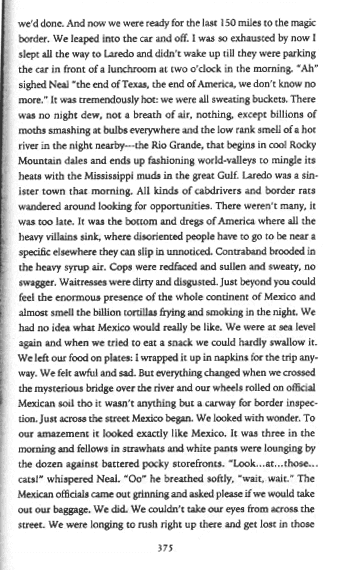 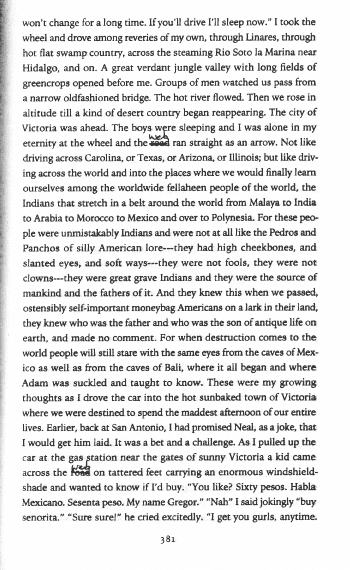 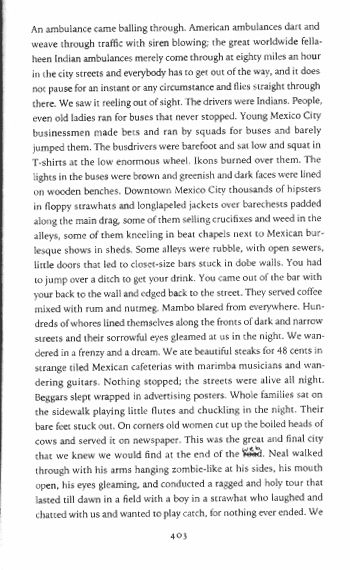 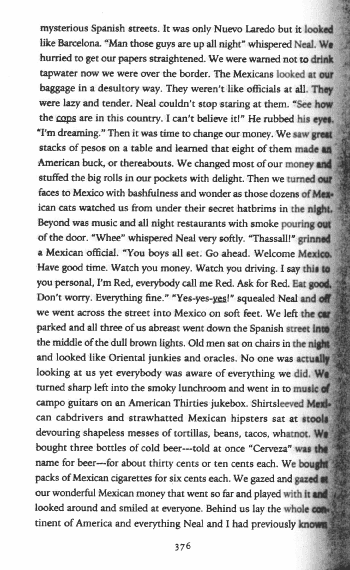 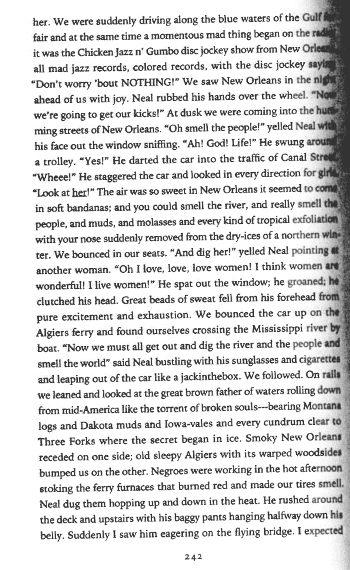 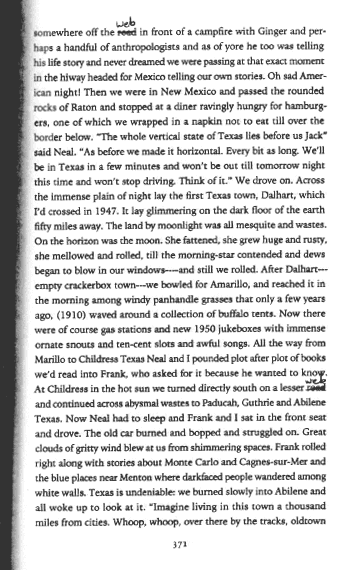 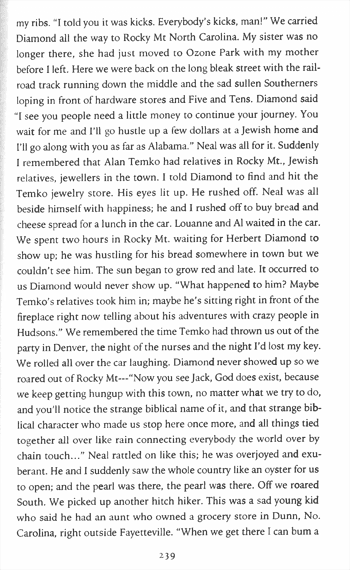 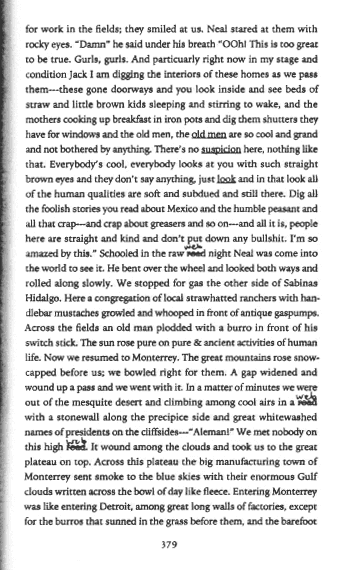 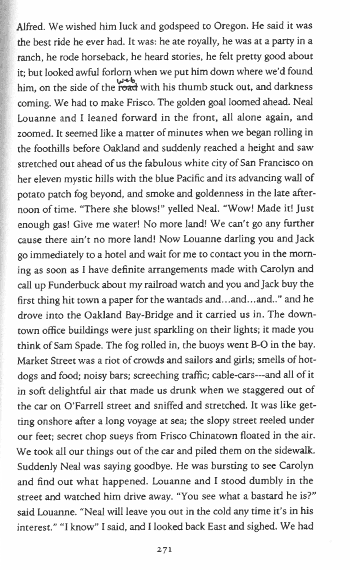 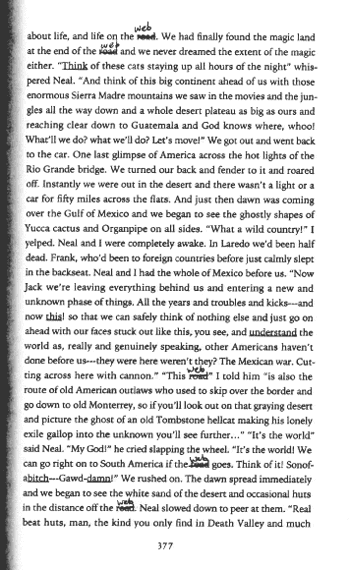 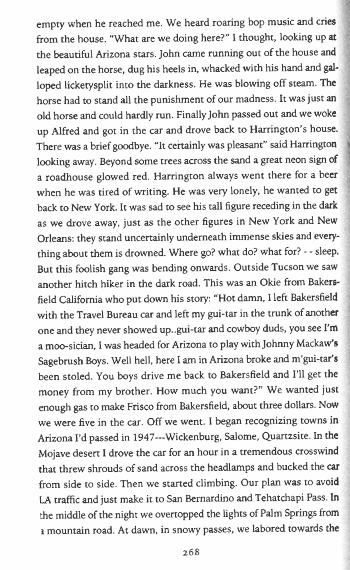 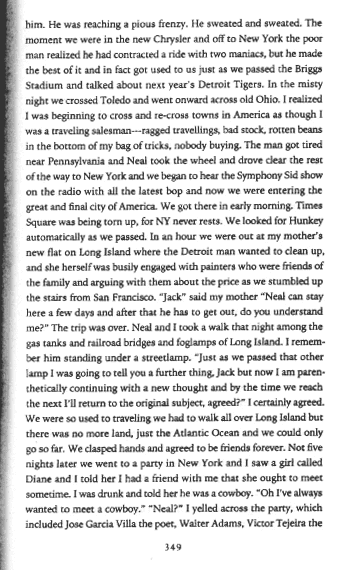 ON THE WEB is a translation of Jack Kerouac’s 1957 classic, On The Road for the modern web browser. 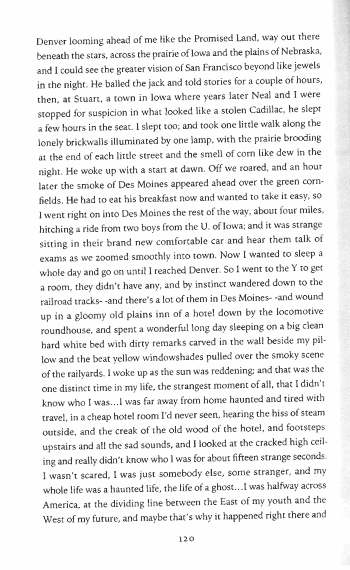 This is the fourth time the artist xtine has read Kerouac’s road novel. 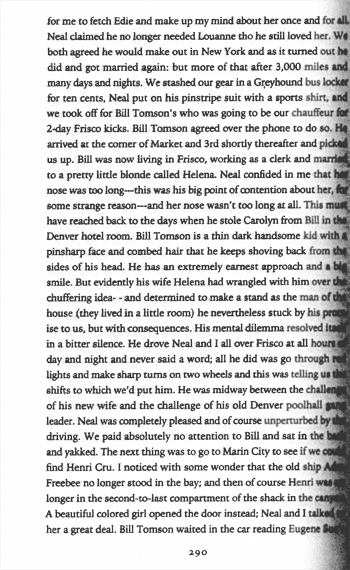 The last reading was for a hand-made letterpress-printed paper bag give-away that she presented at City Lights Bookstore in 2007. 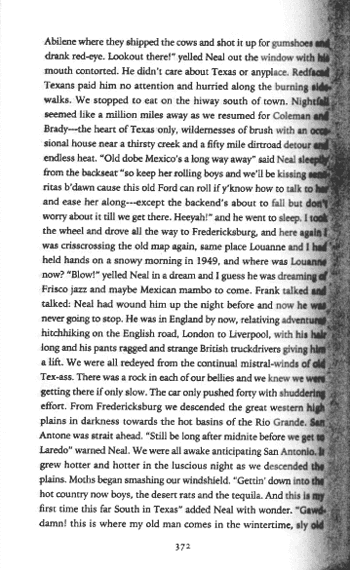 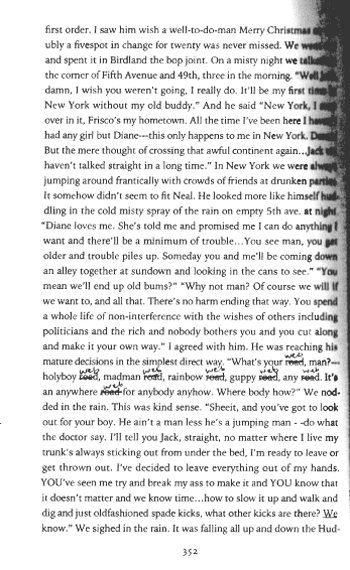 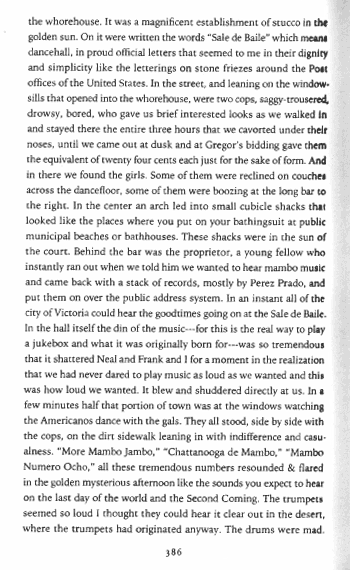 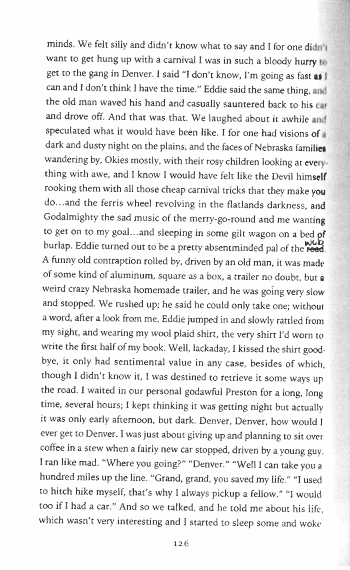 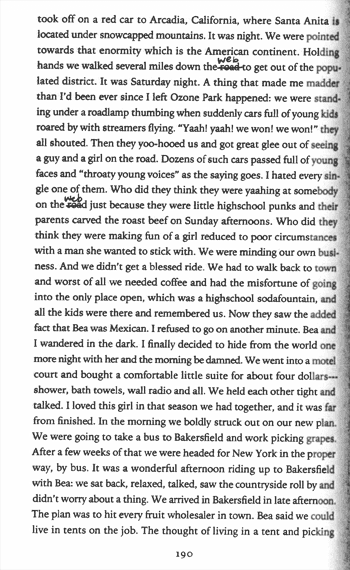 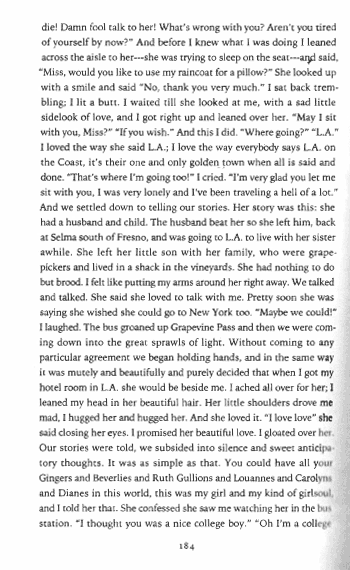 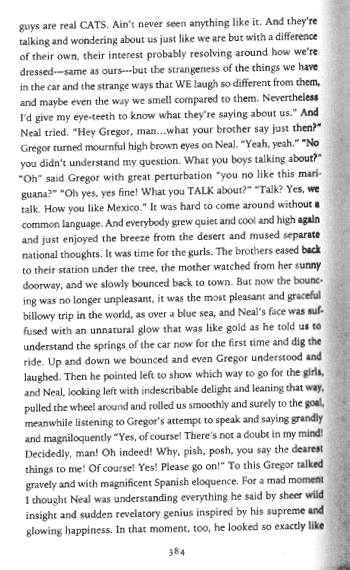 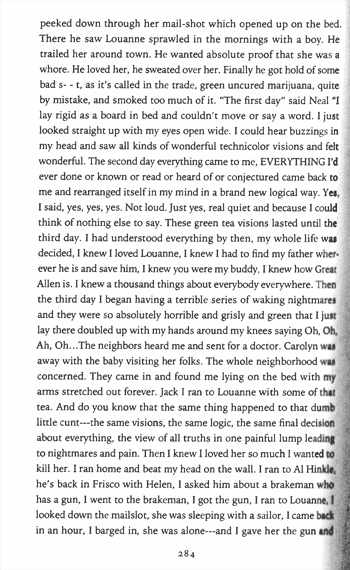 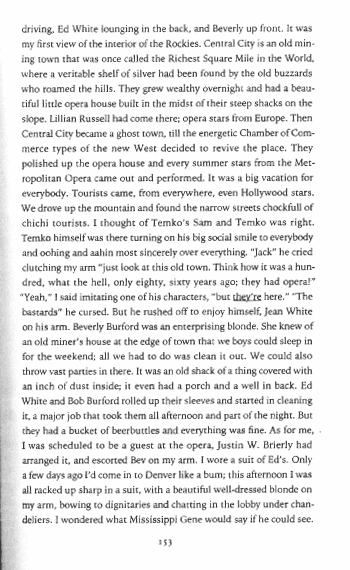 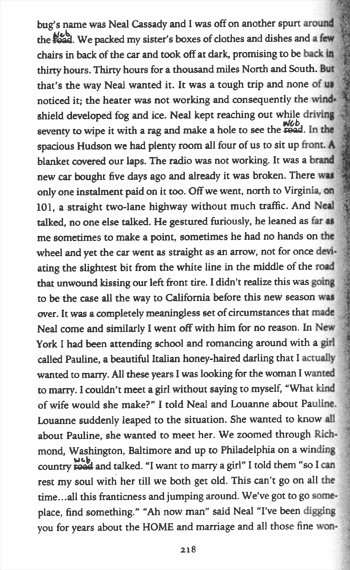 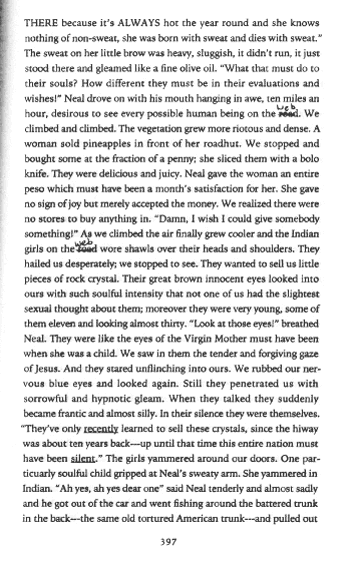 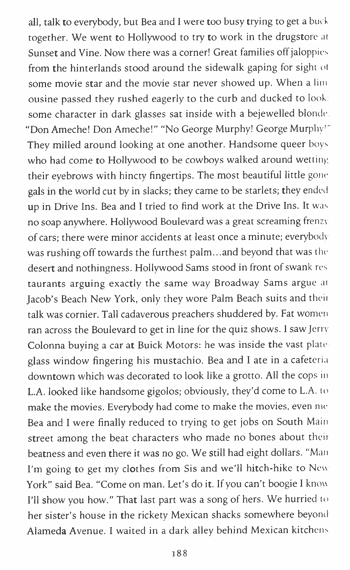 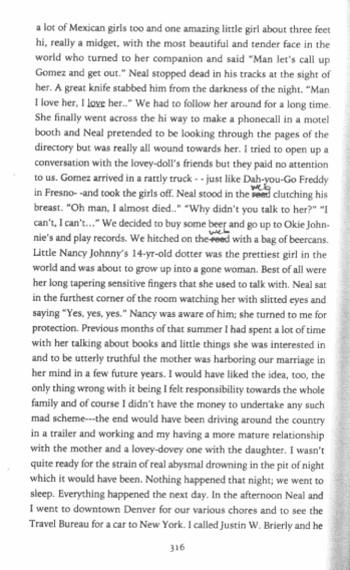 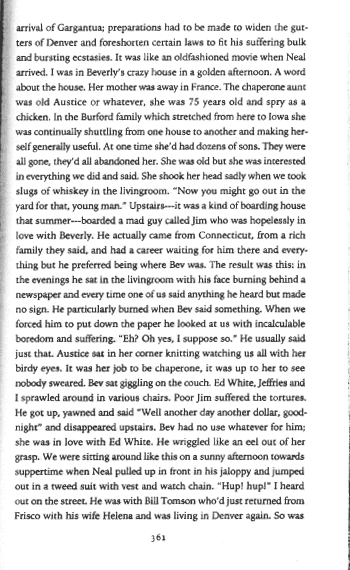 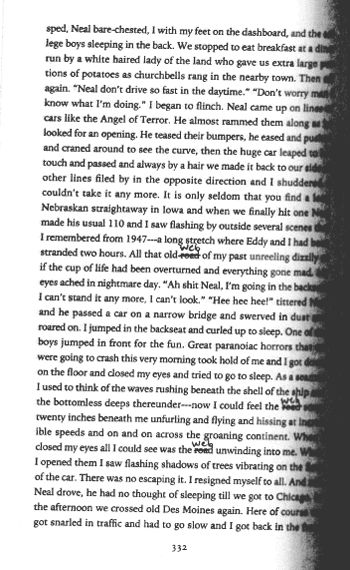 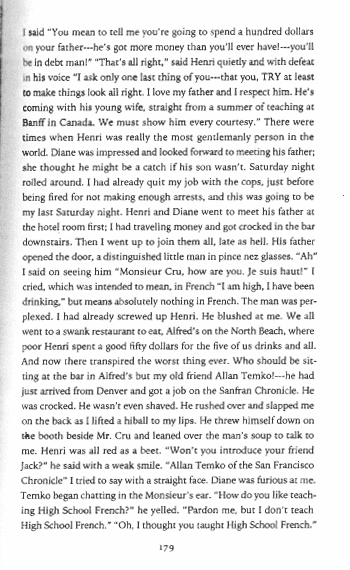 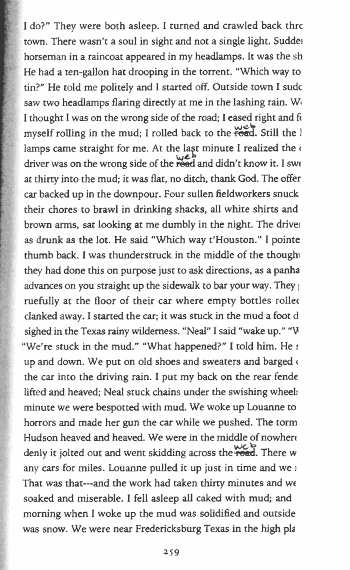 In this interpretation of the novel the artist crossed out every appearance of the word, “road” in her copy of the book and replaced it with the word, “web” to investigate whether modern life and web surfing are reflected in the original road-trip manuscript. 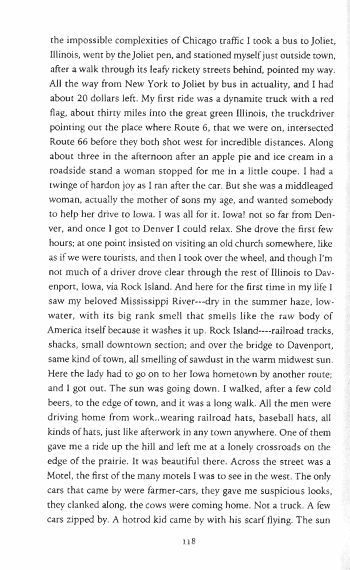 (In many cases, the work still speaks to wanderers browsing the information superhighway or hitchhiking on the open road). 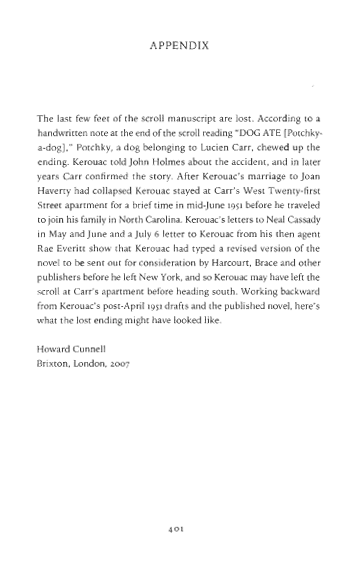 Each page was scanned and uploaded into a design utilizing HTML5 and CSS3 that reflects the original manuscript scroll, enabling the user/reader to scroll through the text in a web browser. 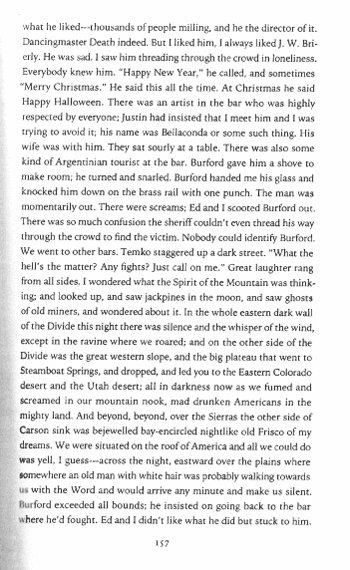 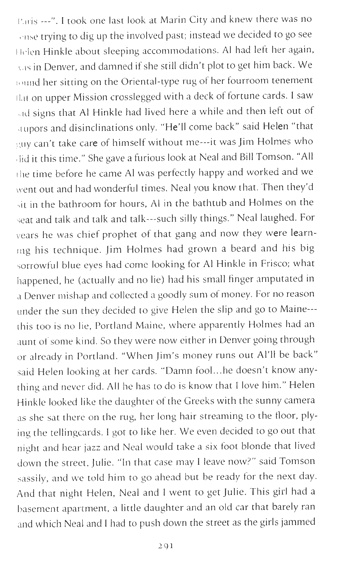 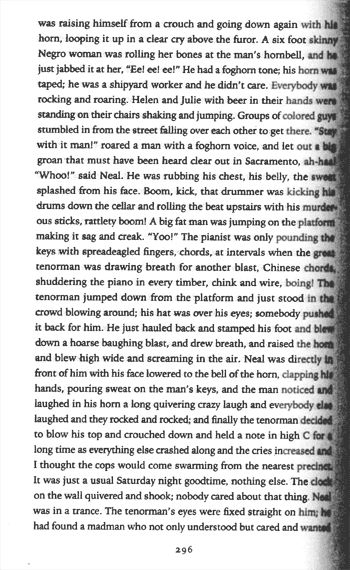 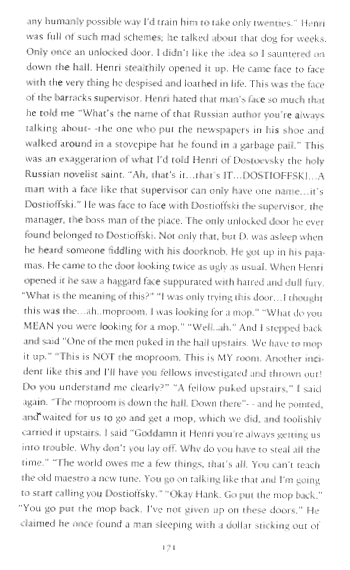 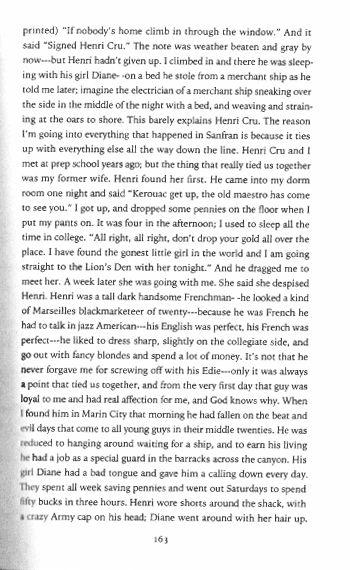 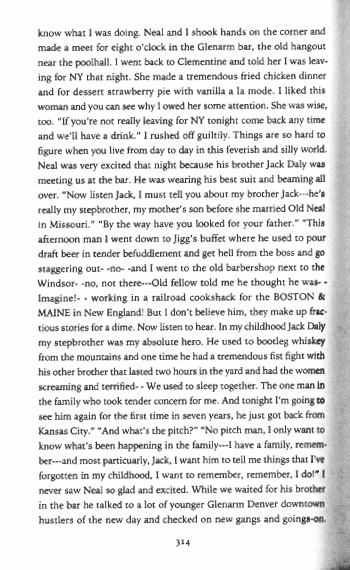 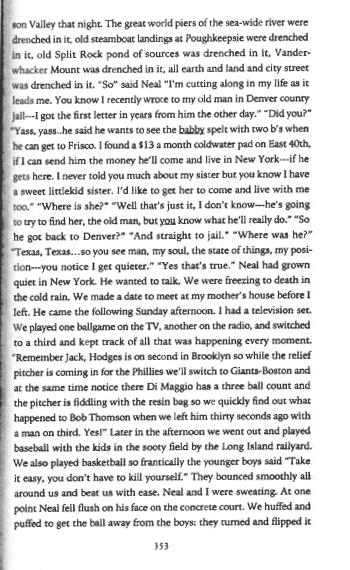 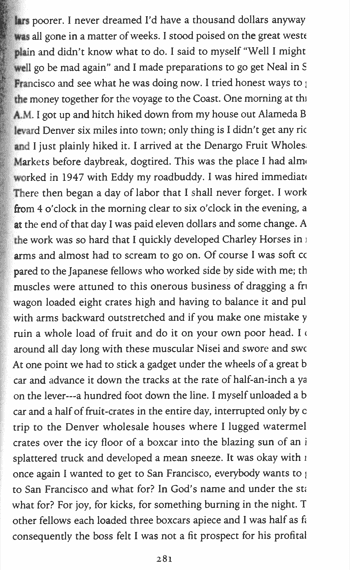 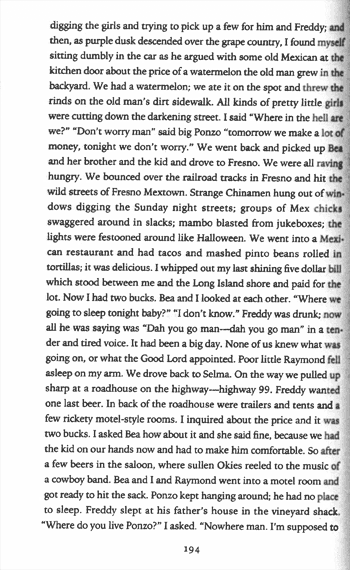 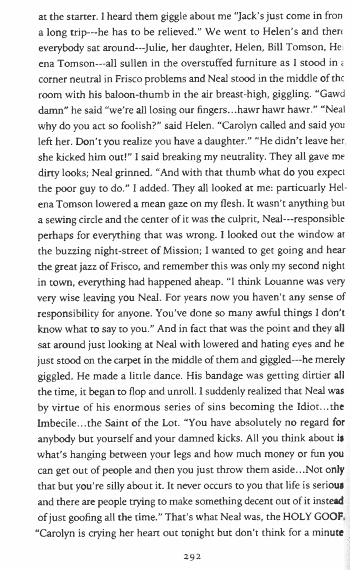 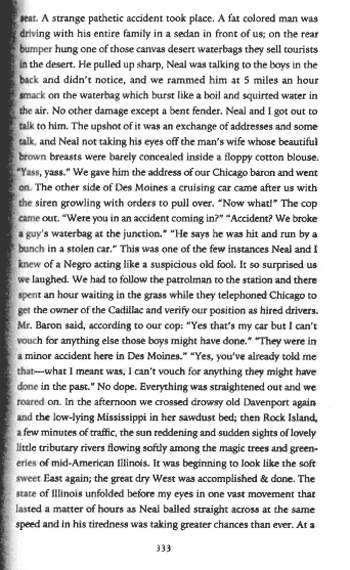 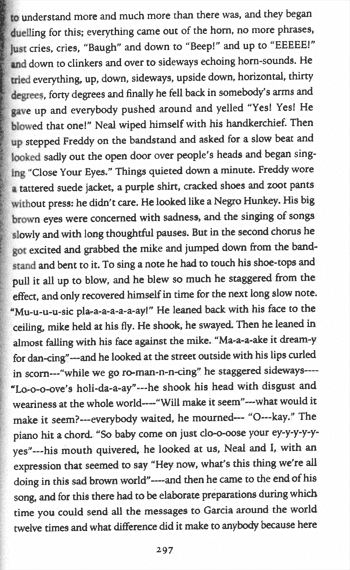 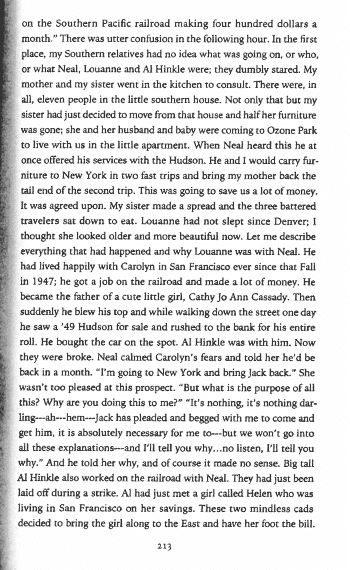 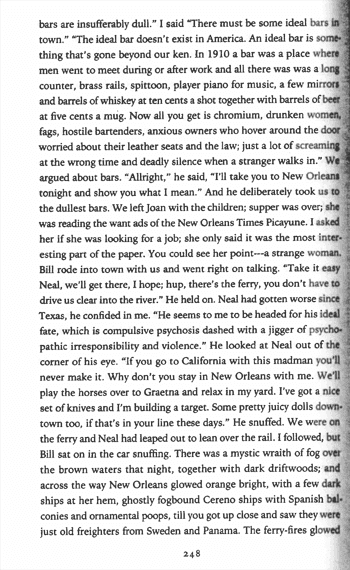 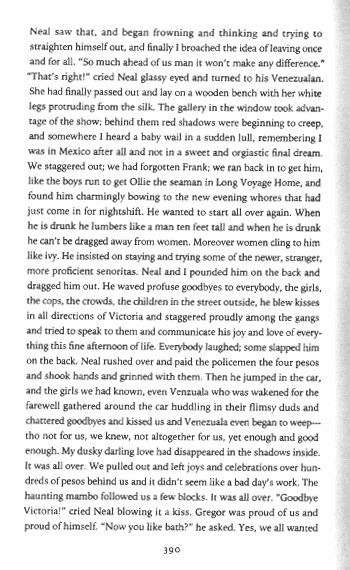 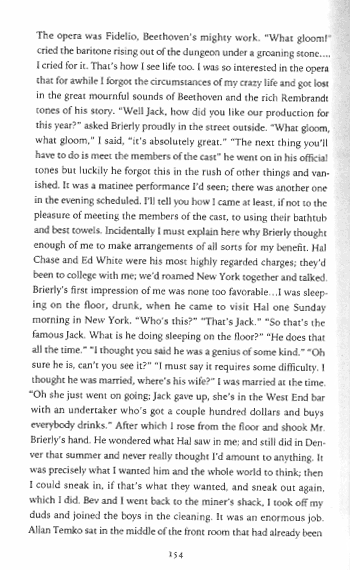 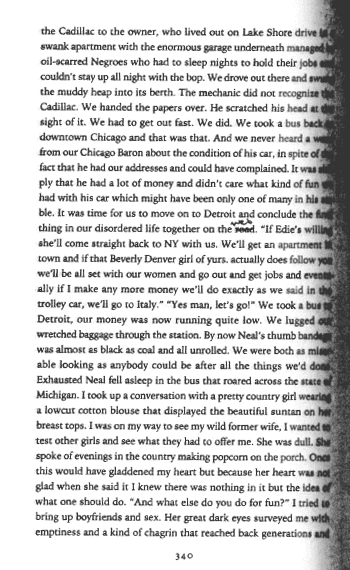 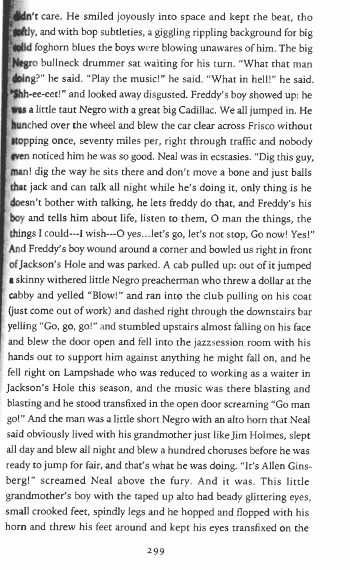 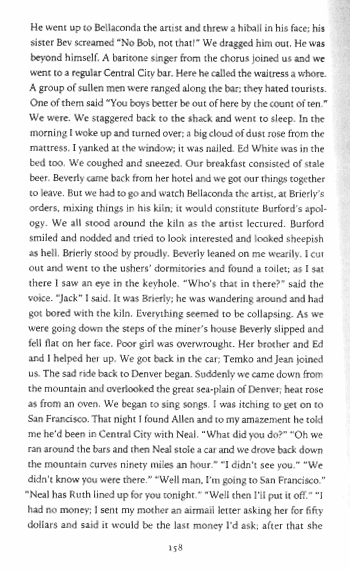 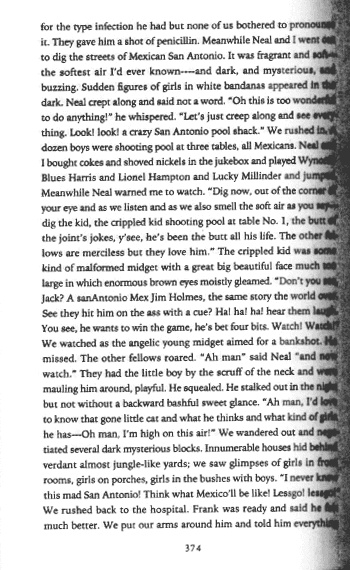 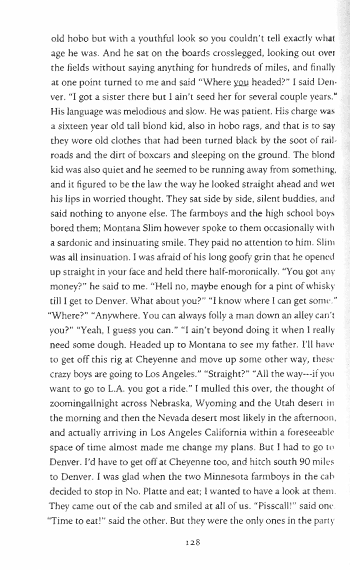 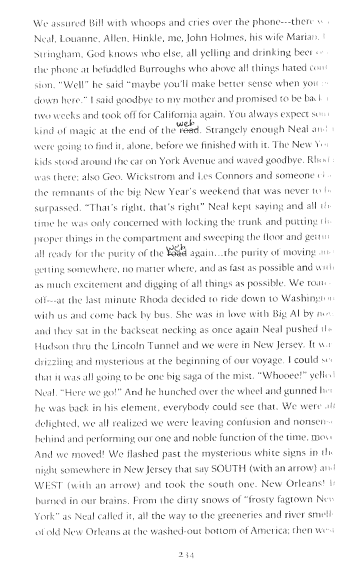 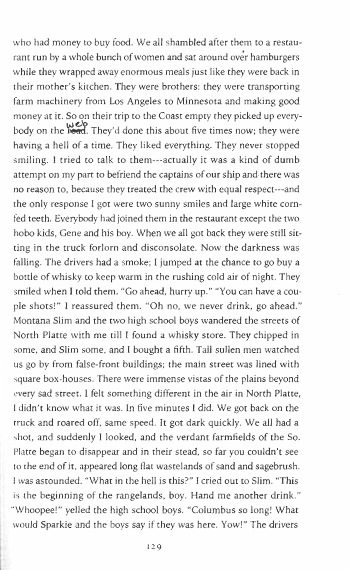 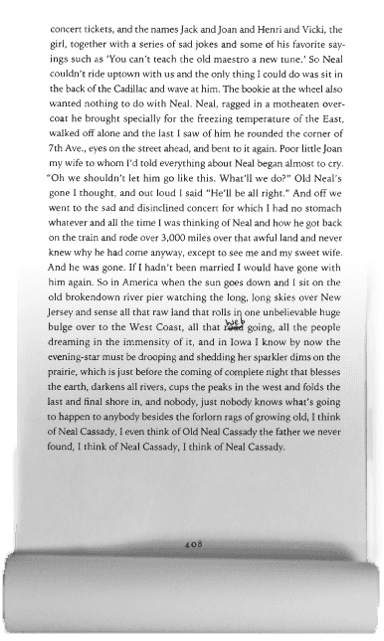 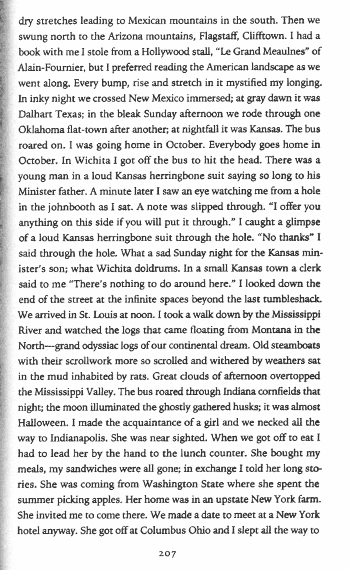 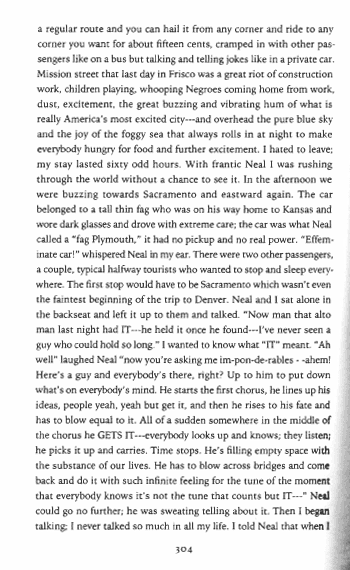 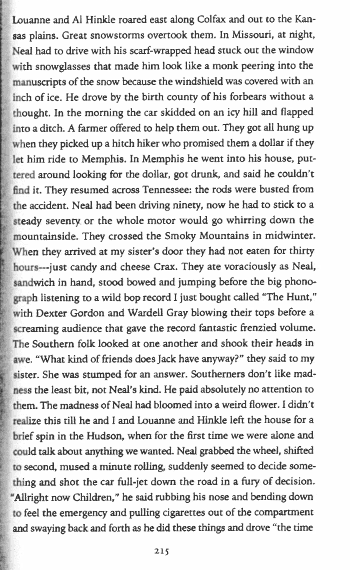 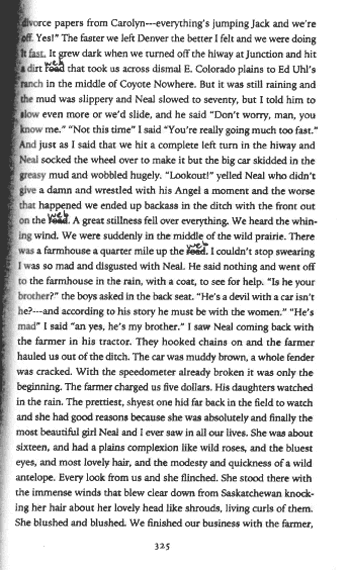 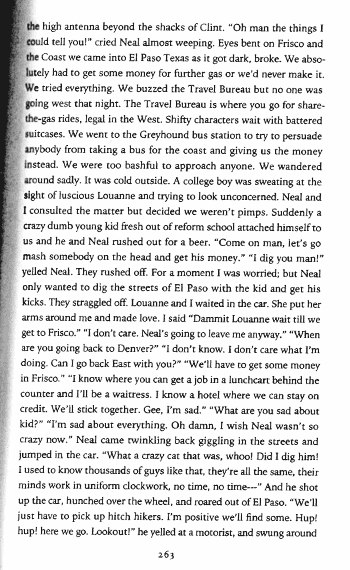 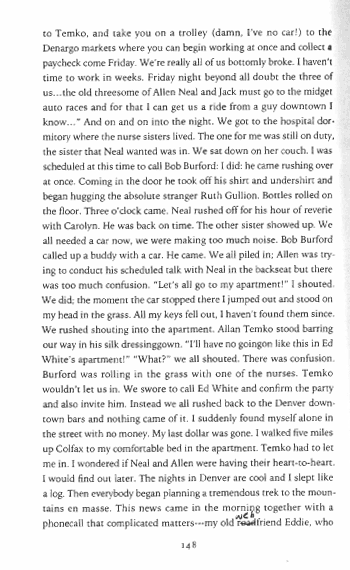 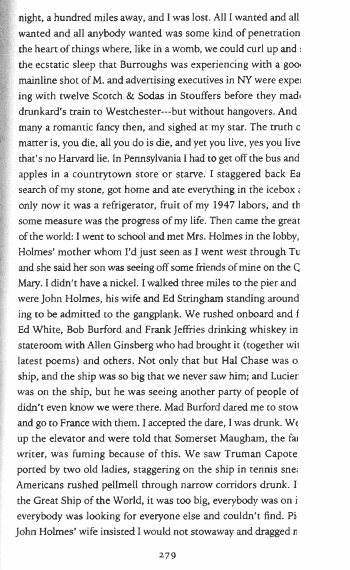 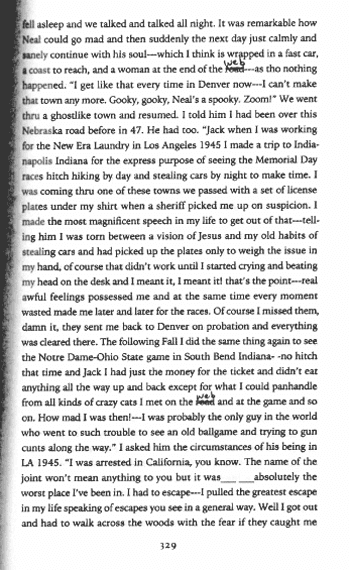 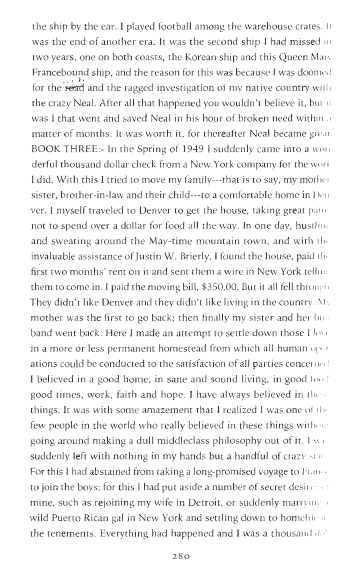 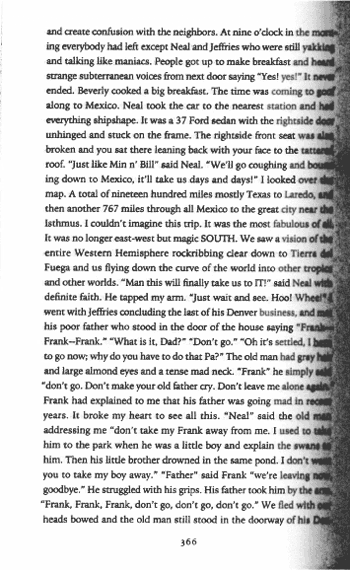 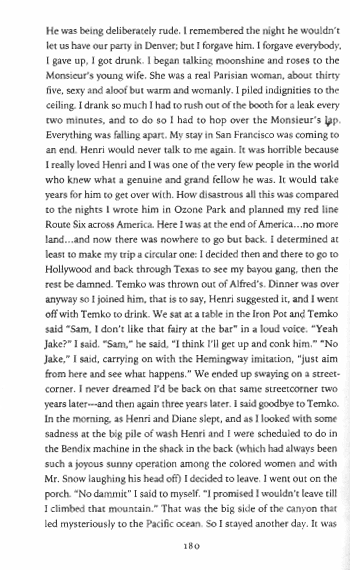 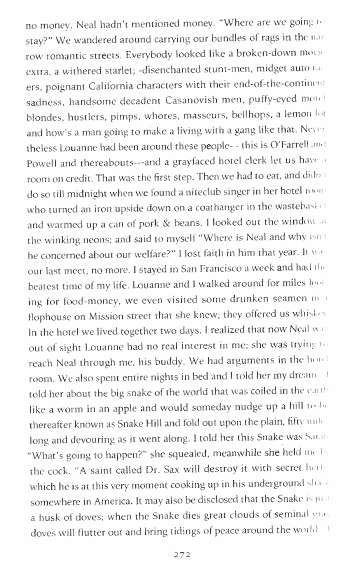 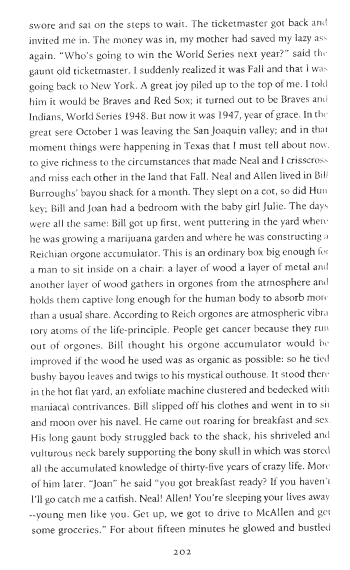 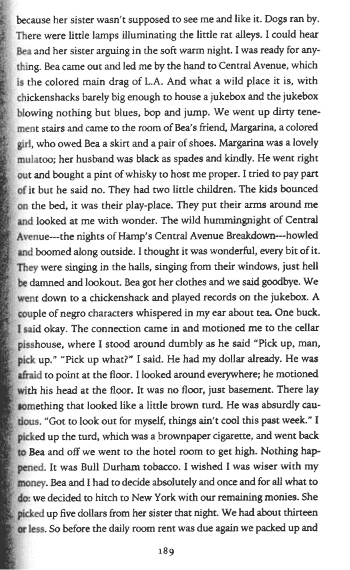 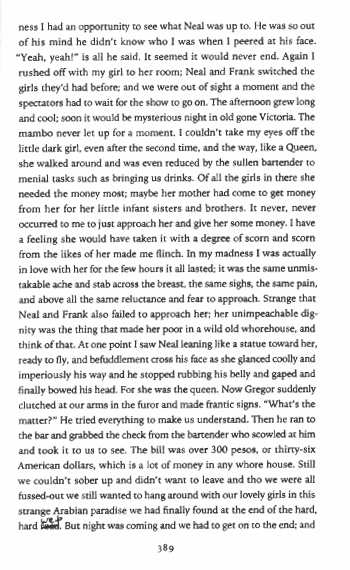 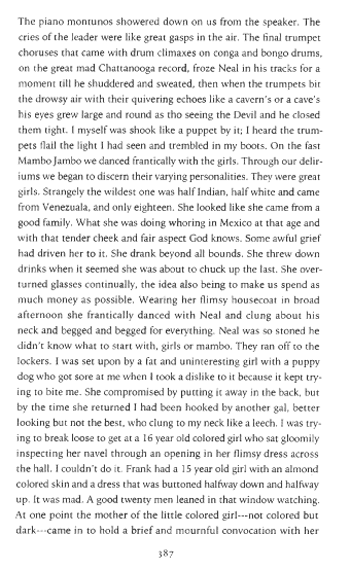 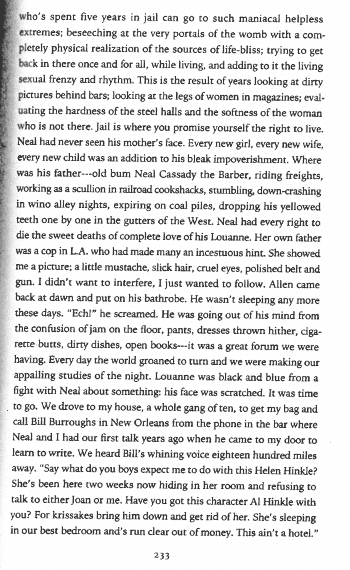 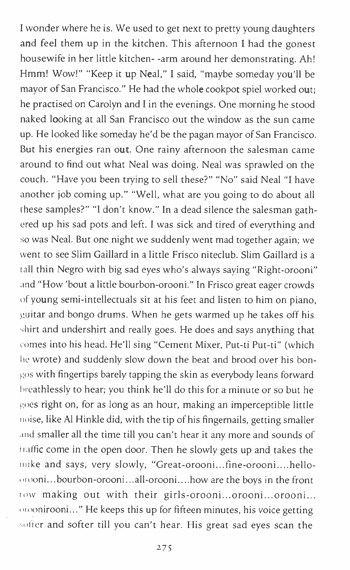 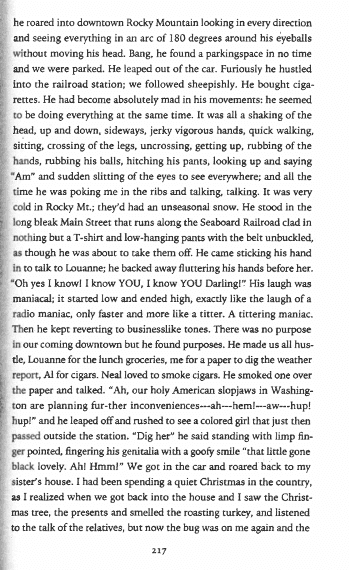 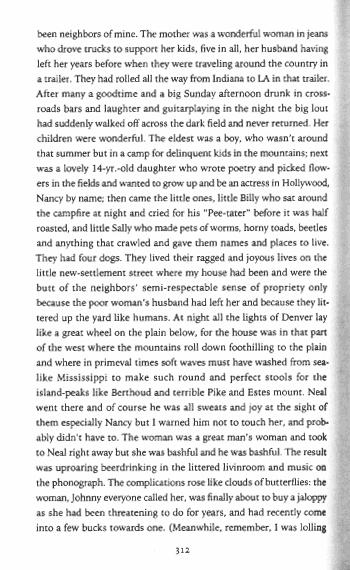 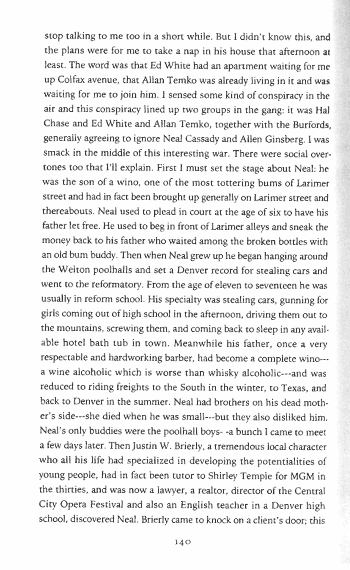 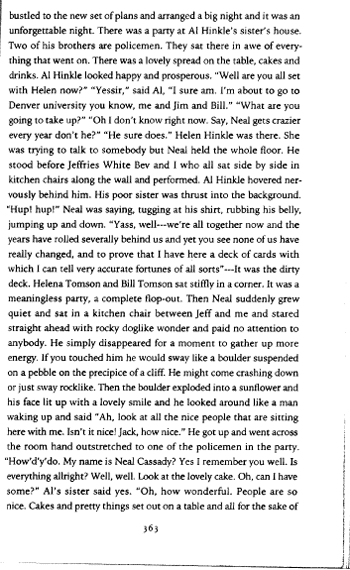 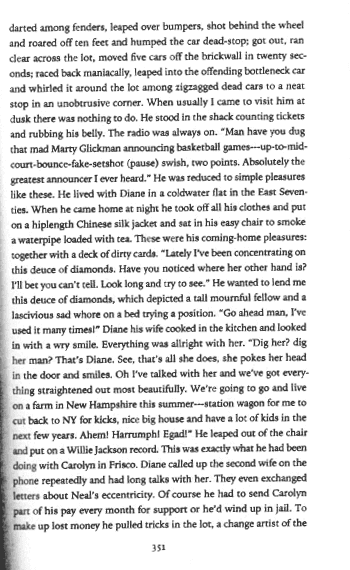 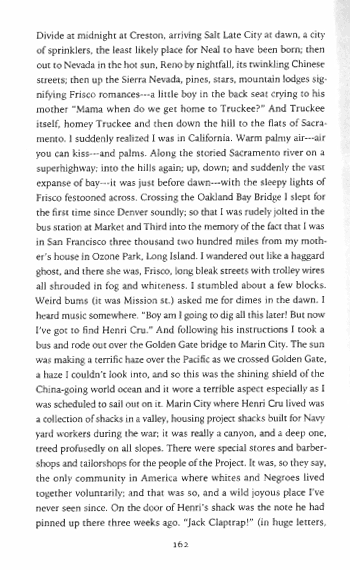 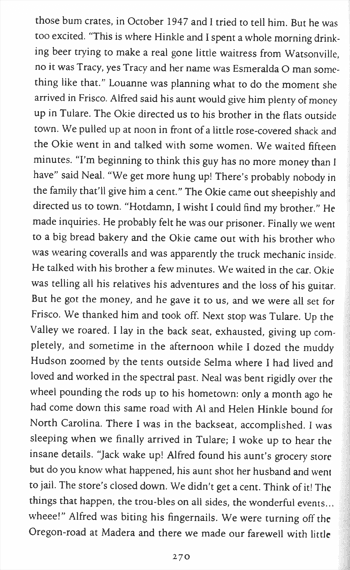 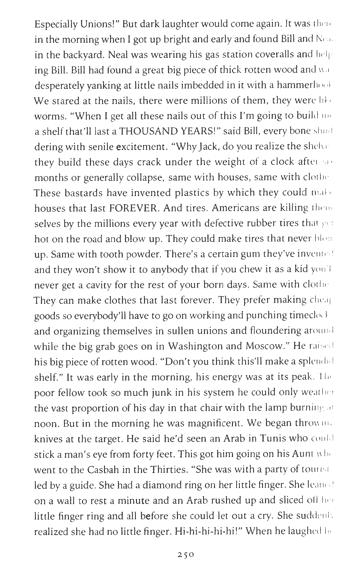 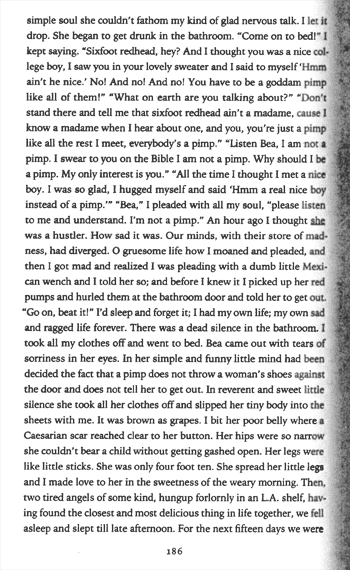 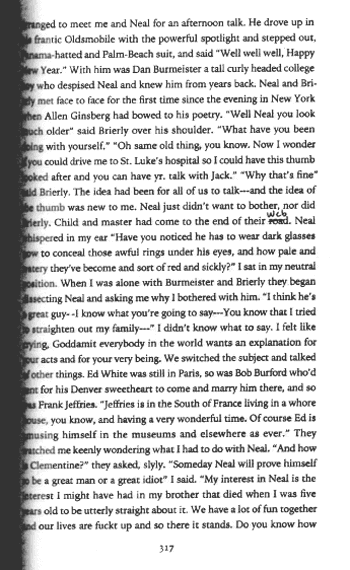 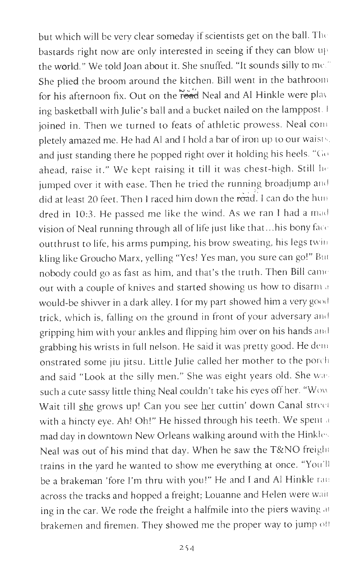 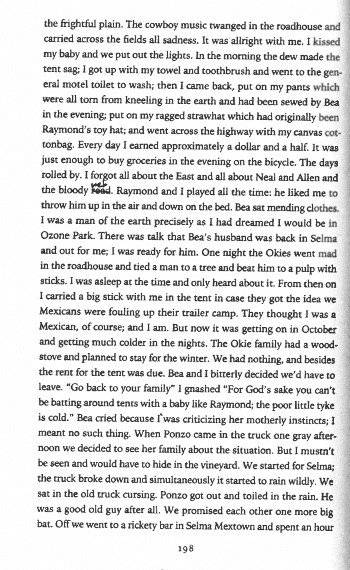 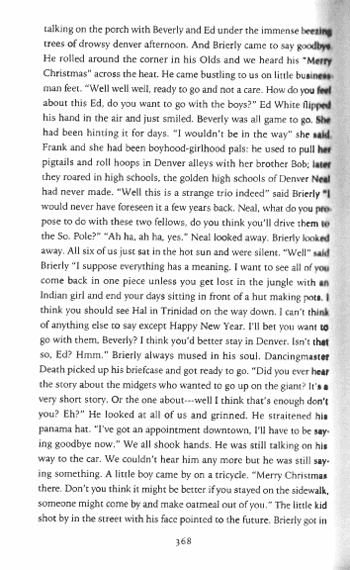 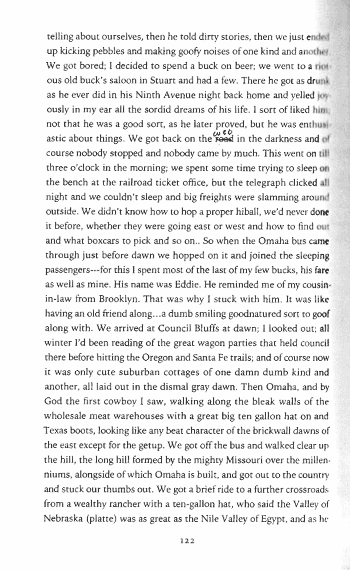 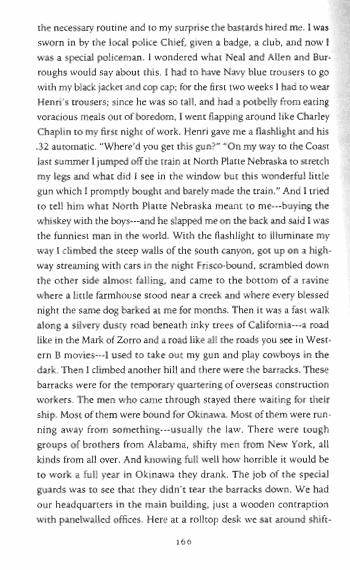 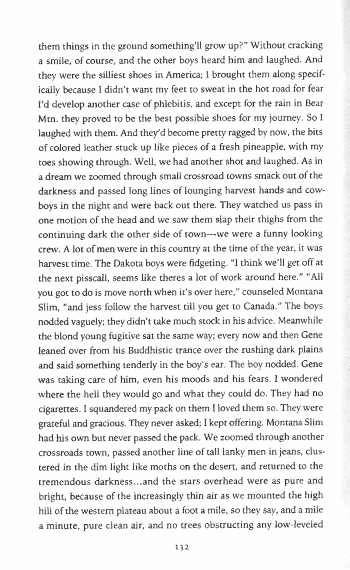 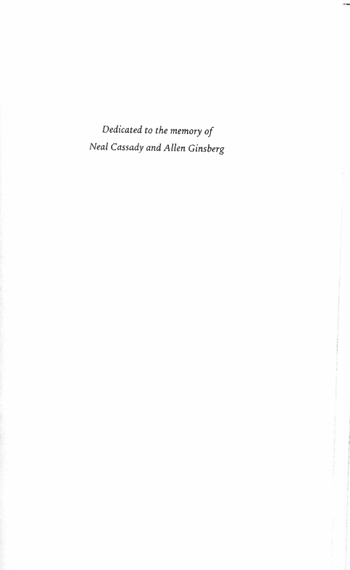 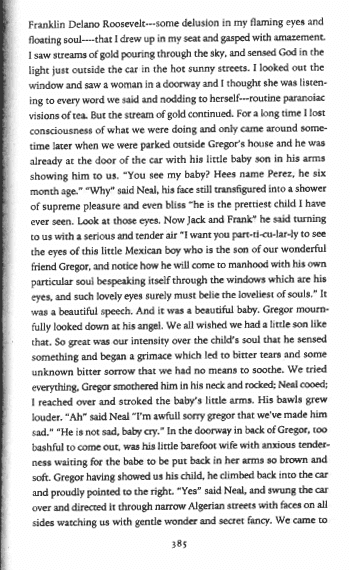 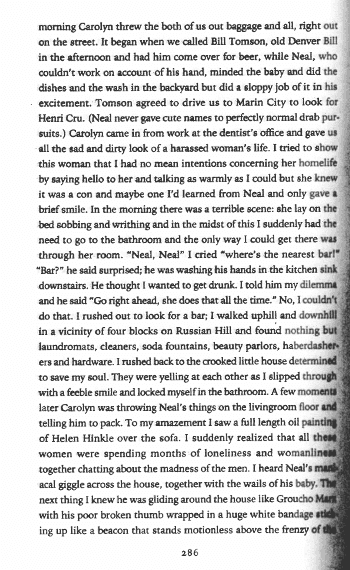 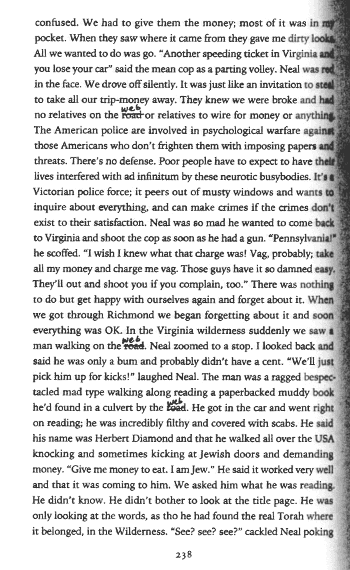 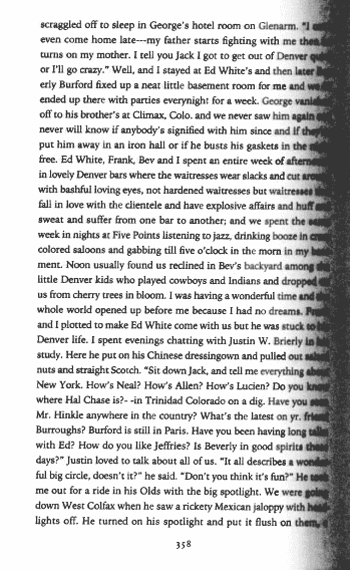 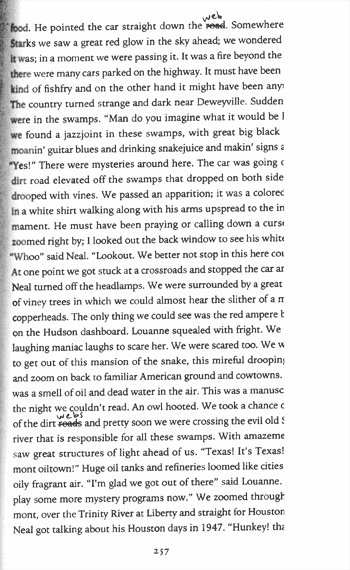 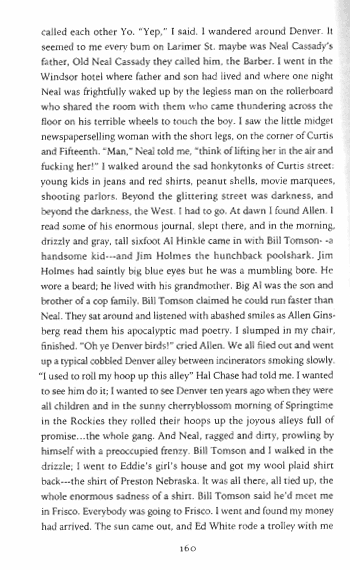 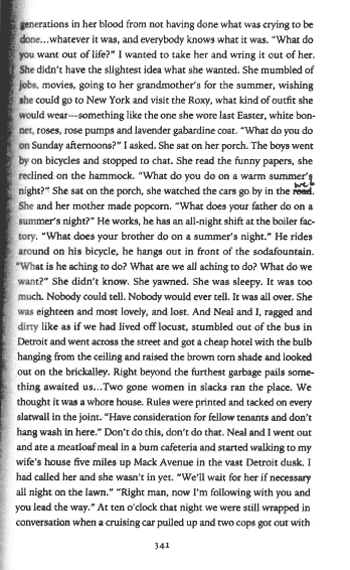 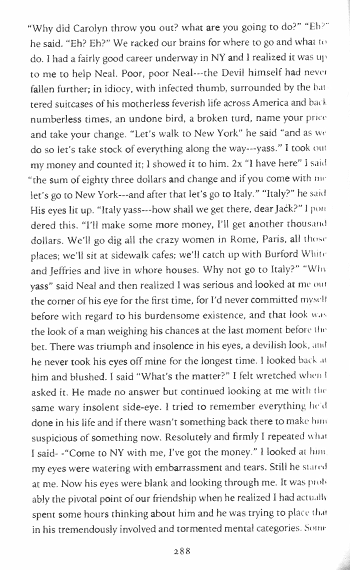 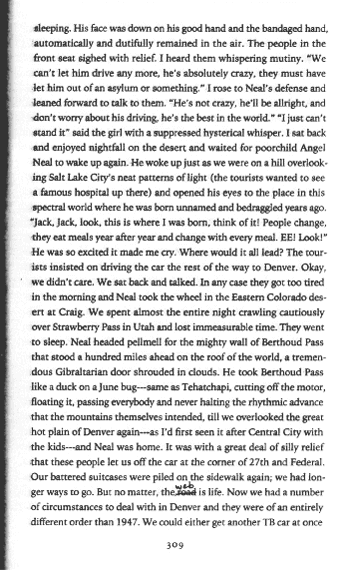 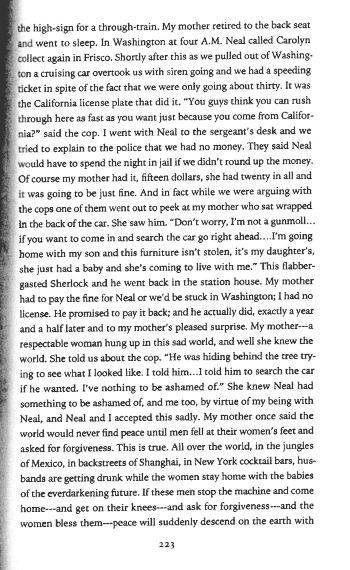 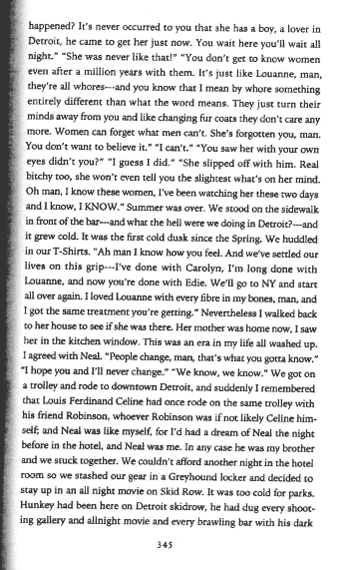 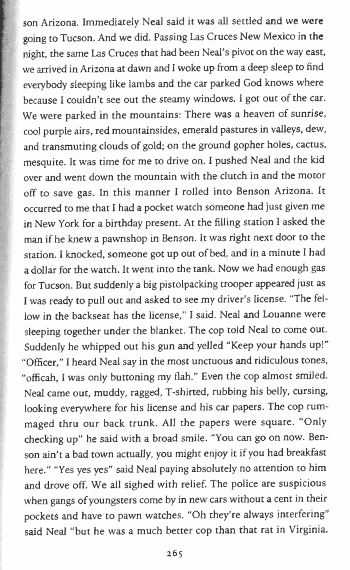 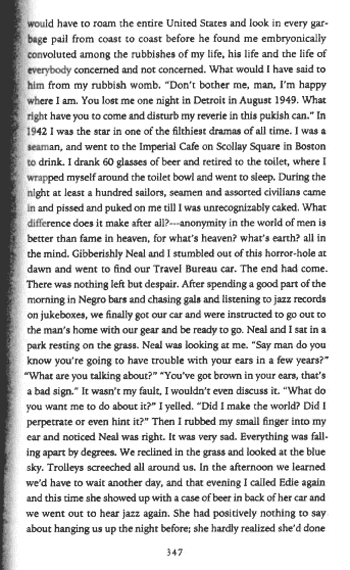 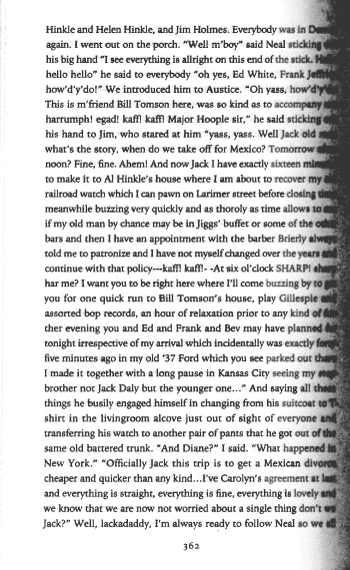 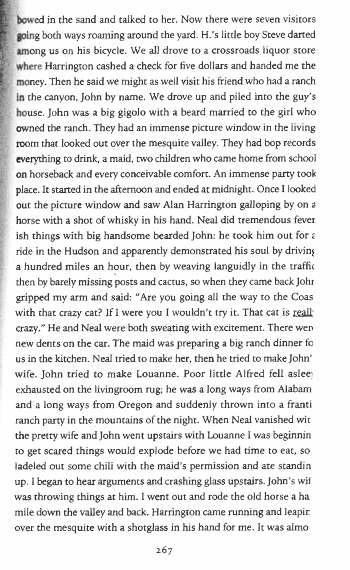 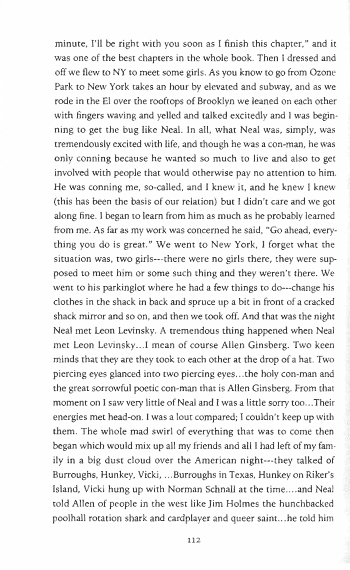 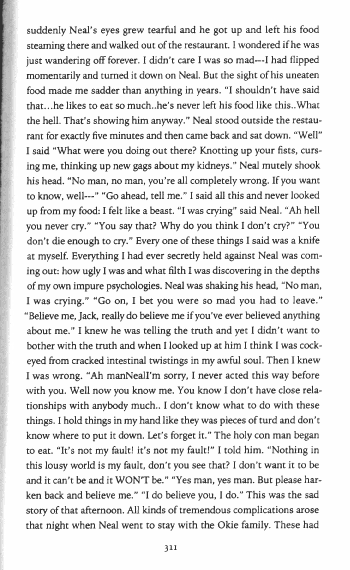 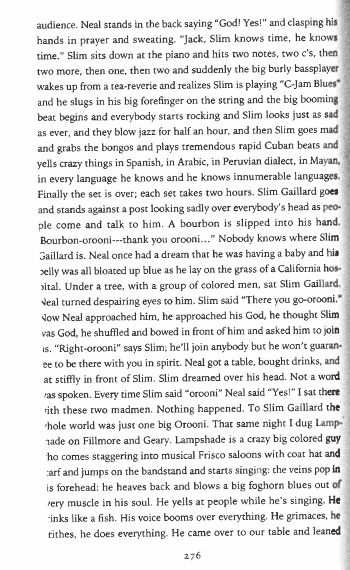 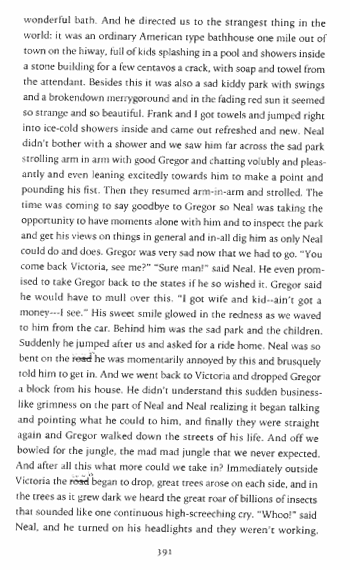 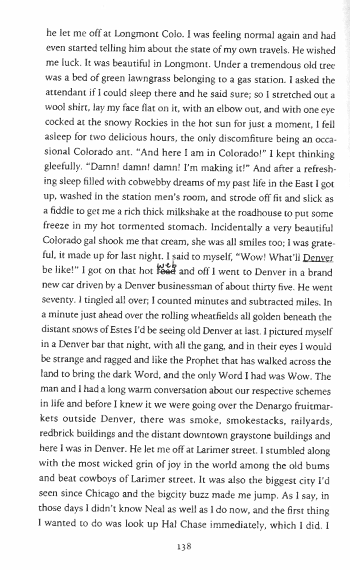 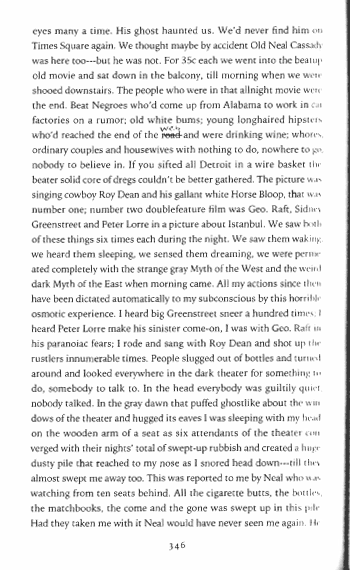 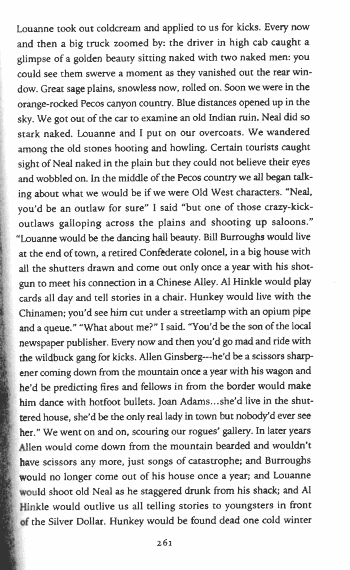 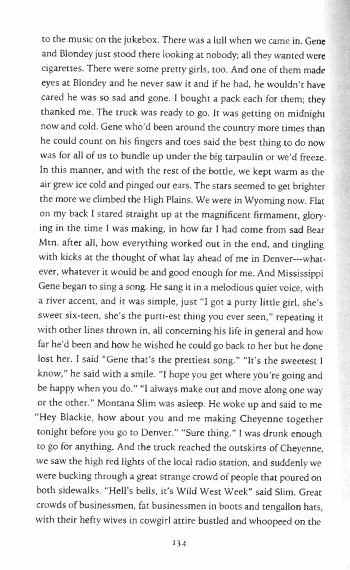 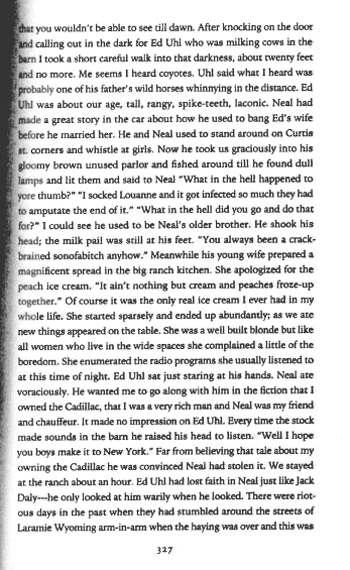 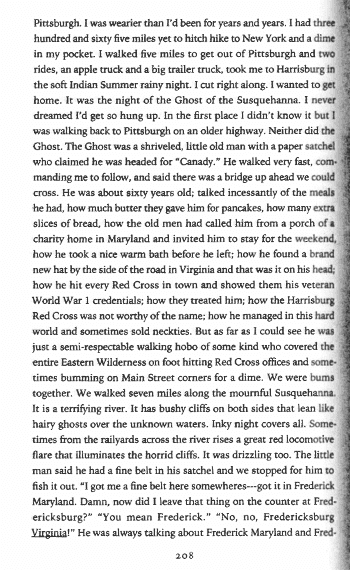 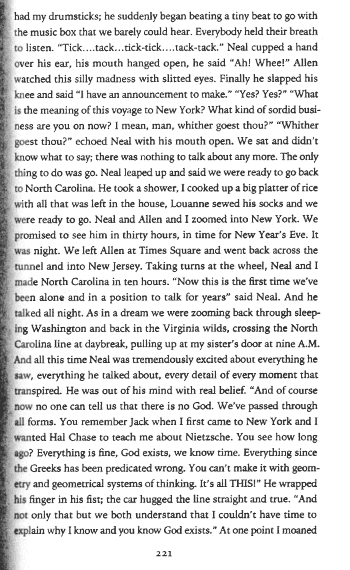 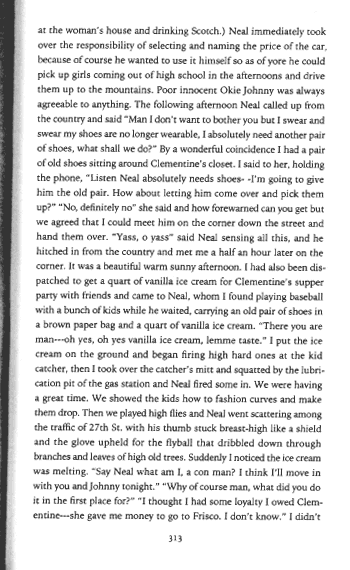 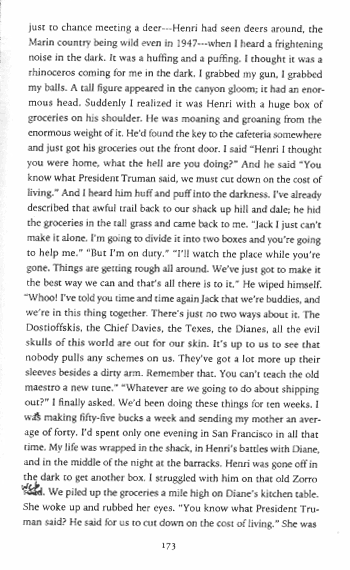 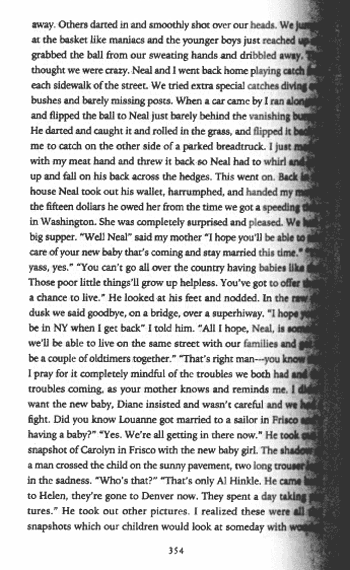 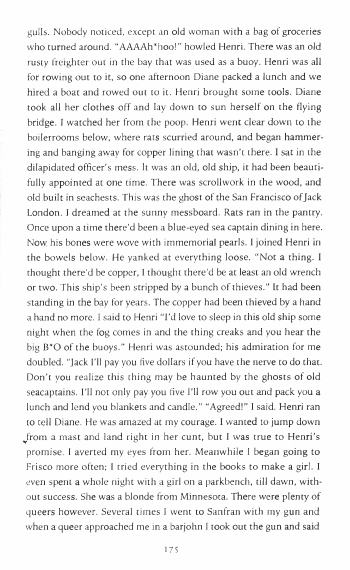 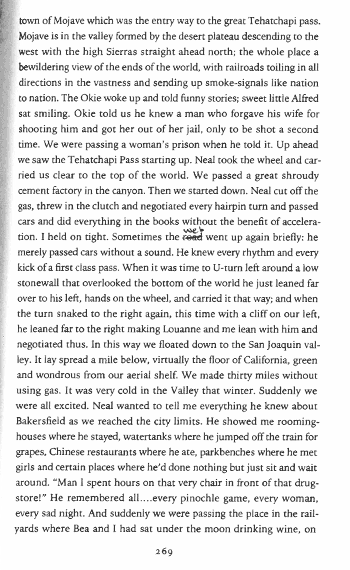 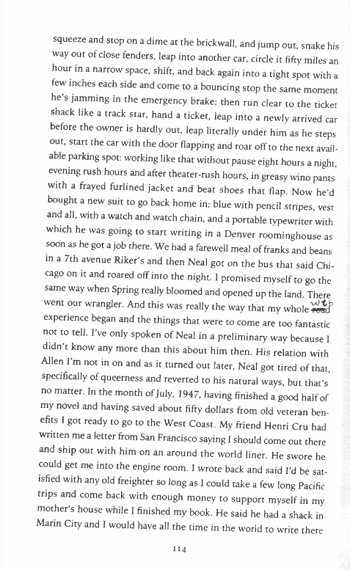 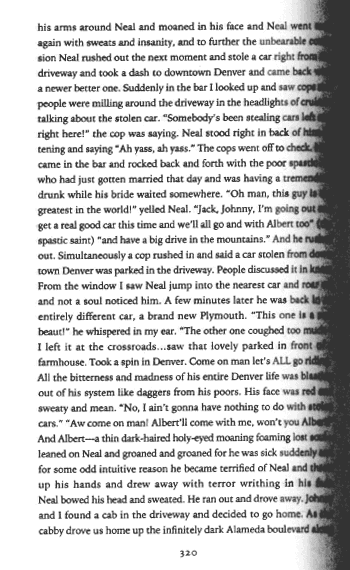 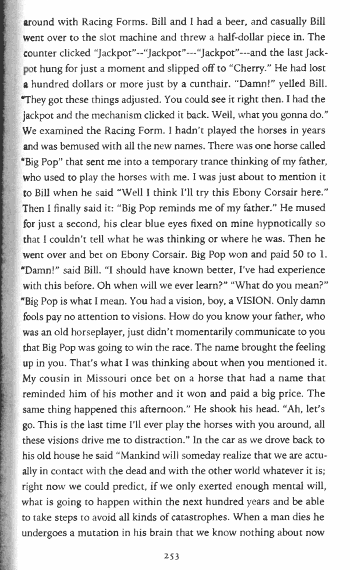 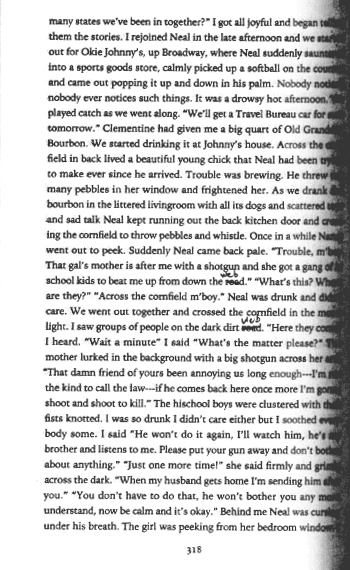 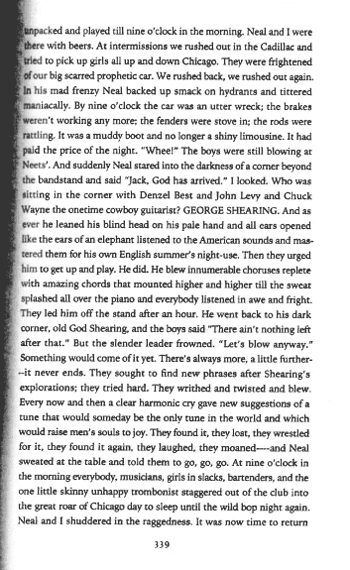 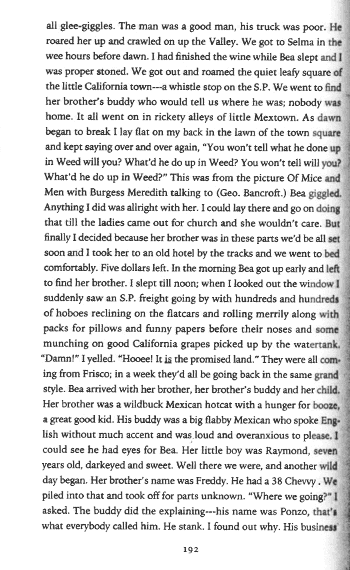 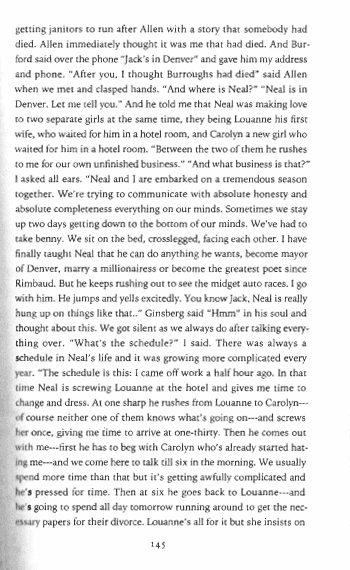 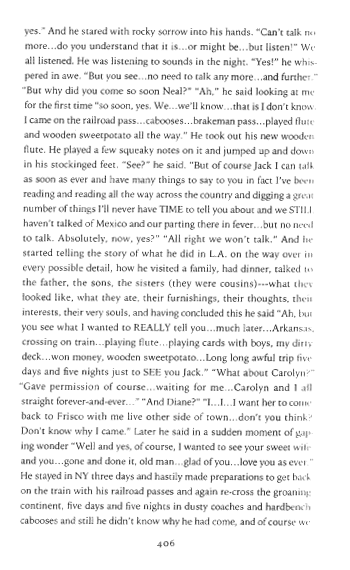 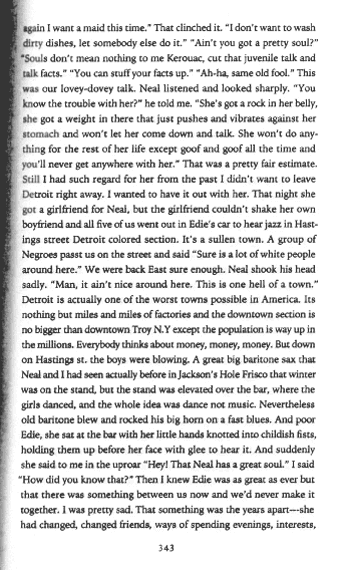 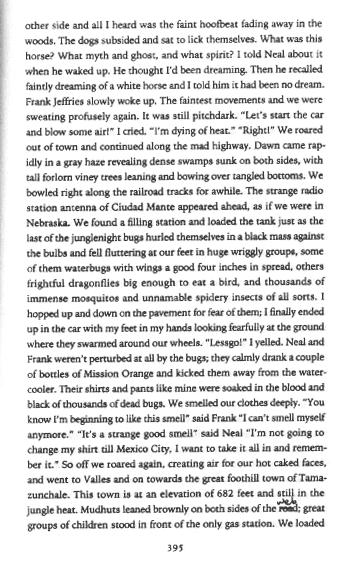 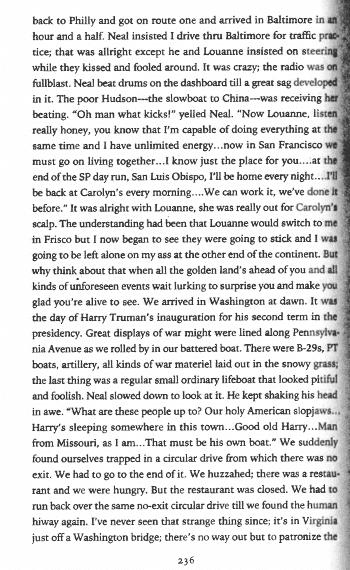 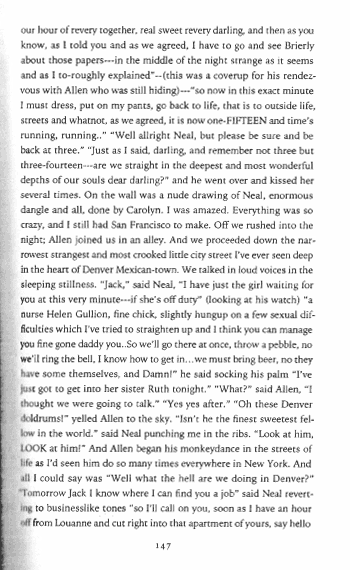 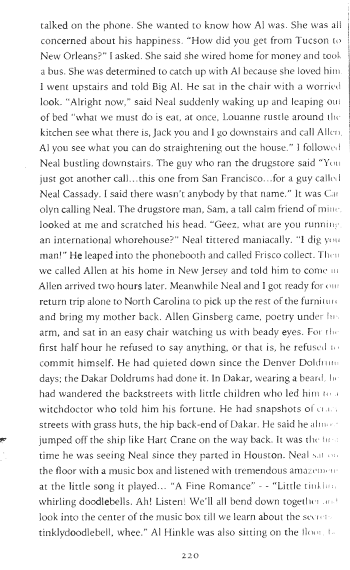 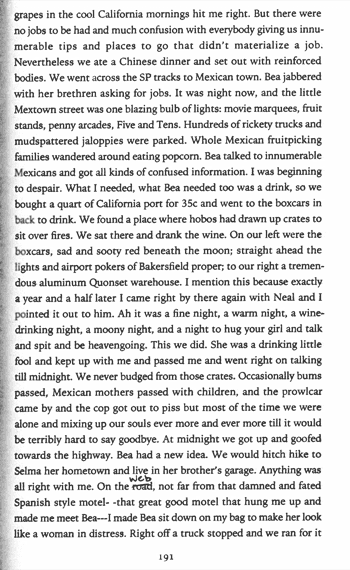 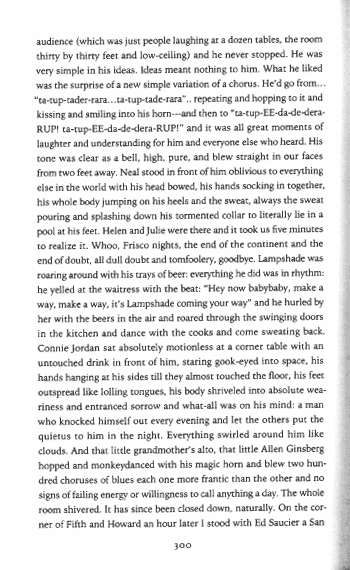 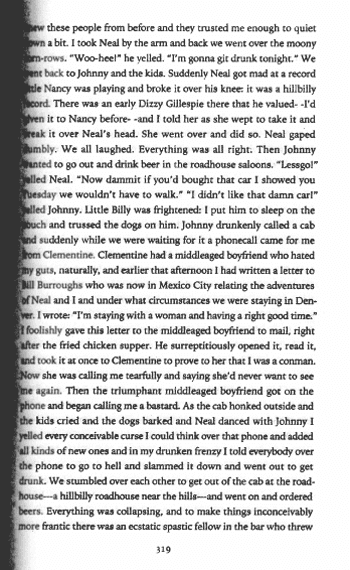 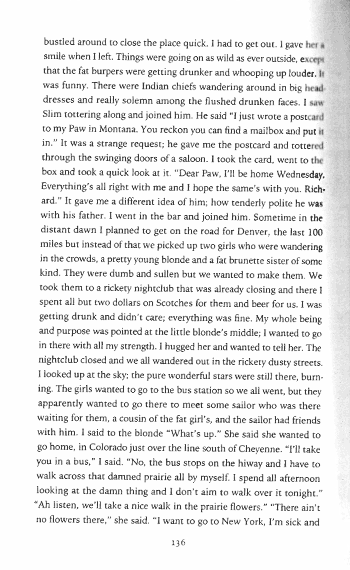 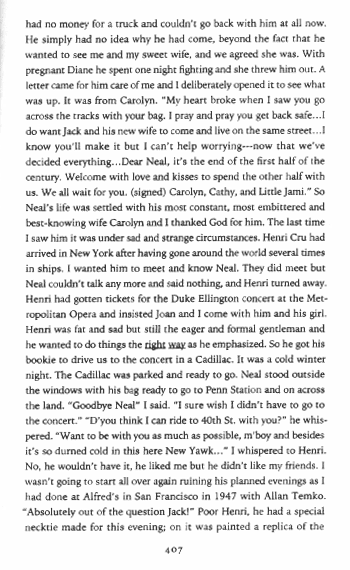 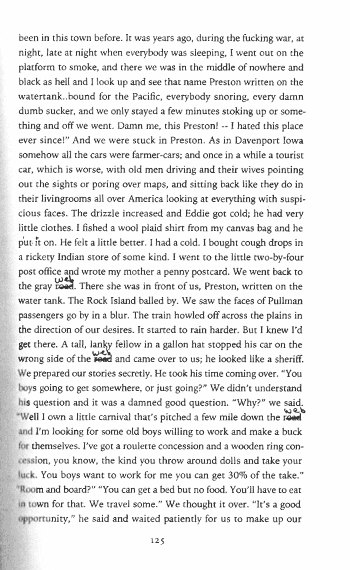 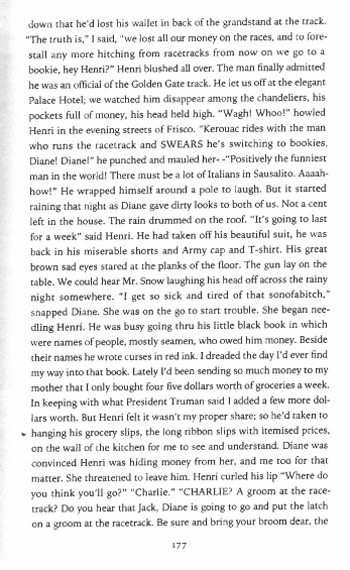 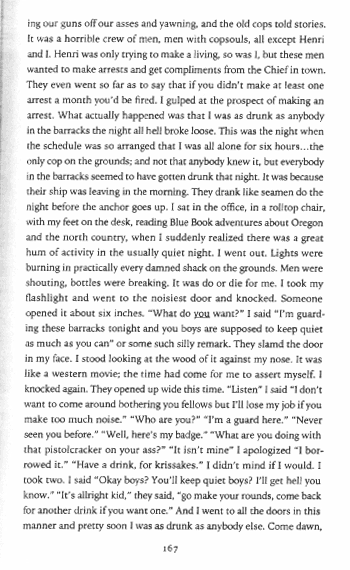 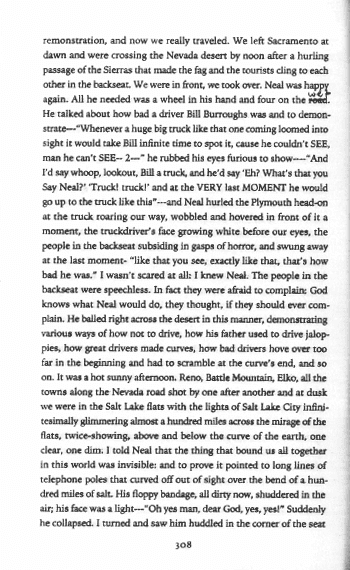 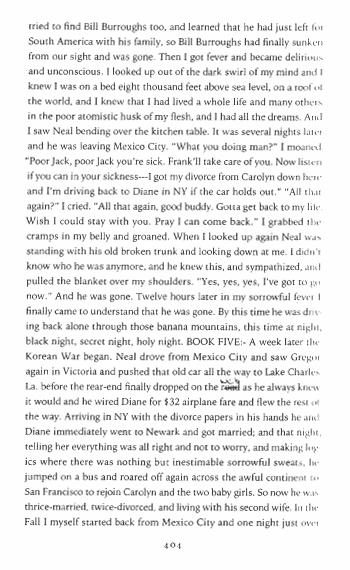 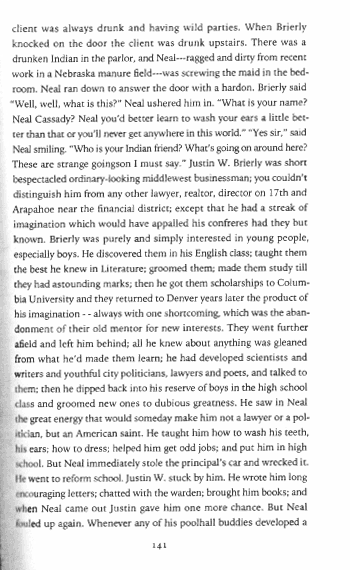 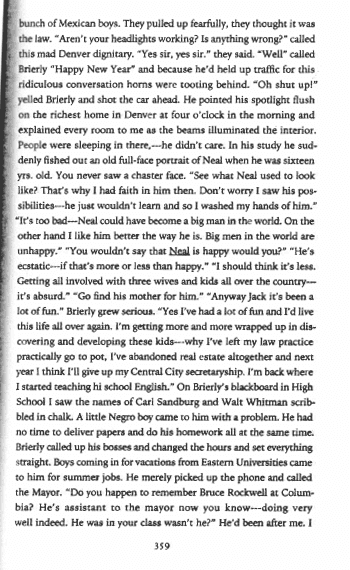 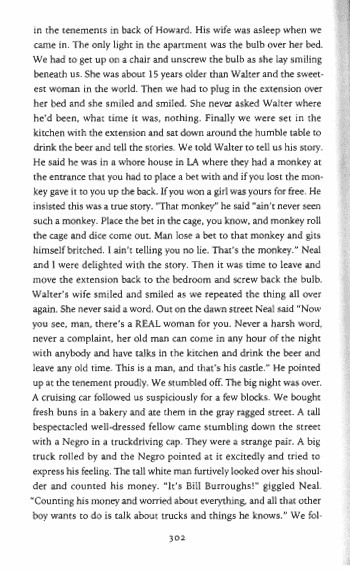 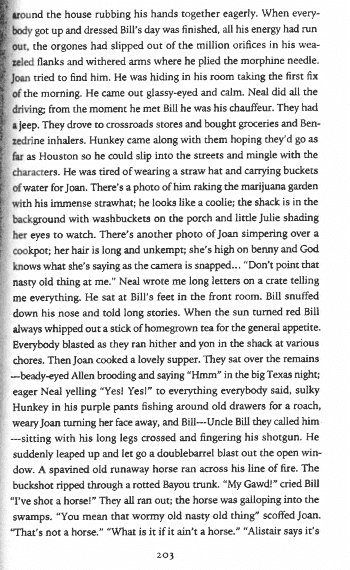 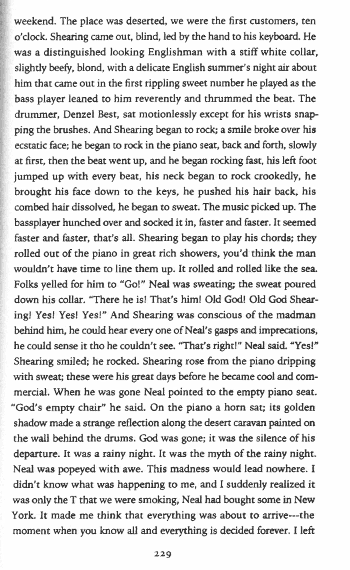 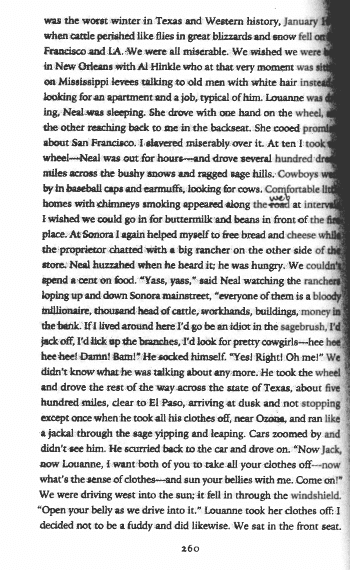 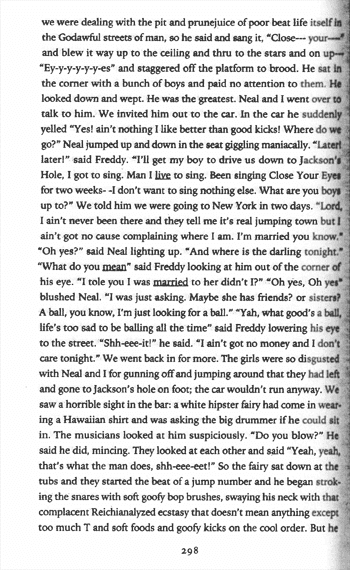 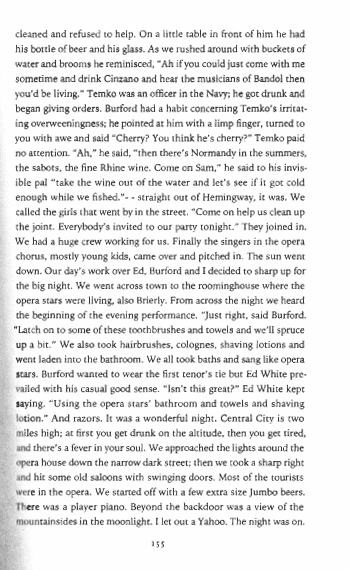 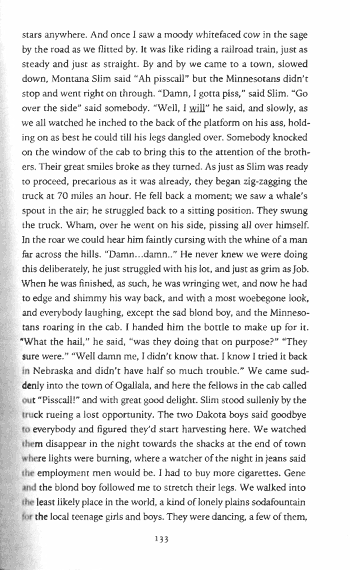 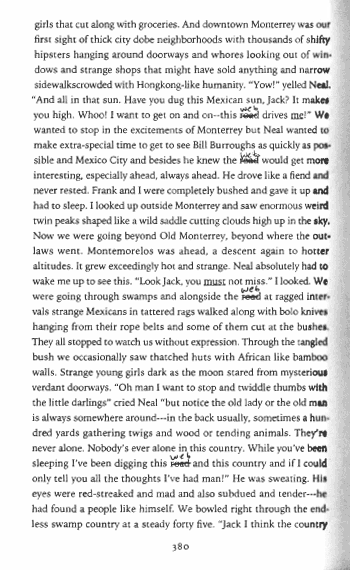 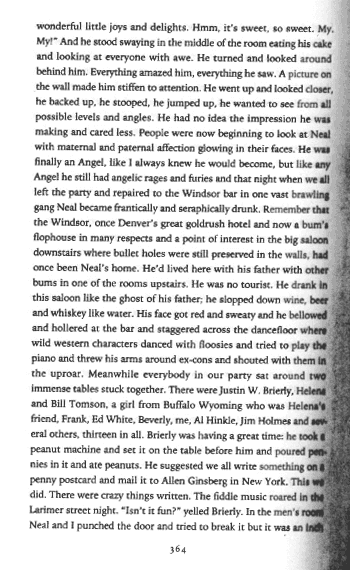 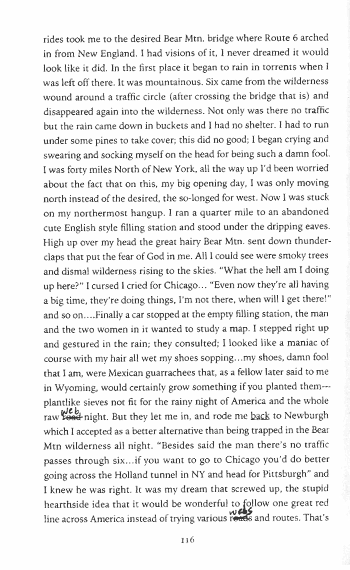 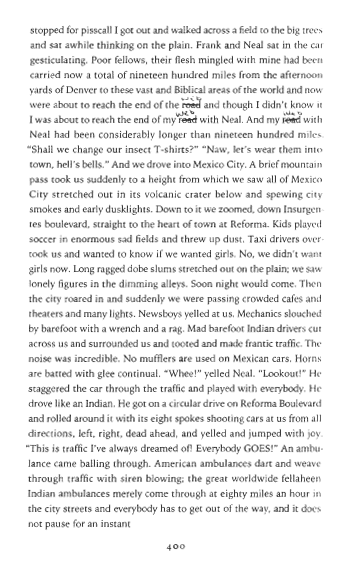 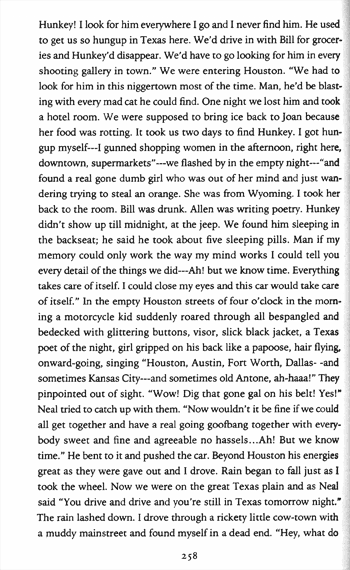 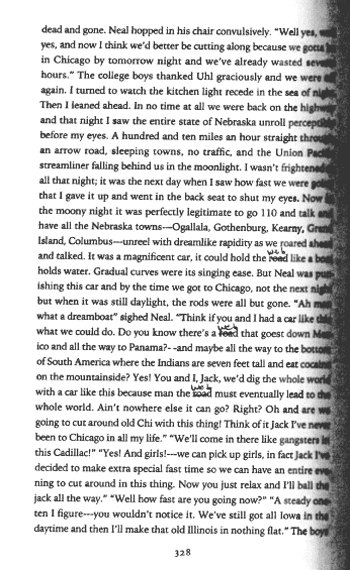 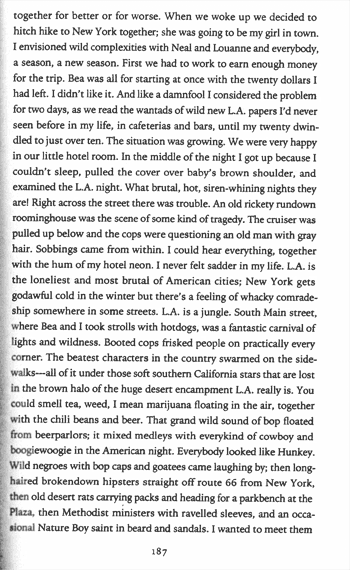 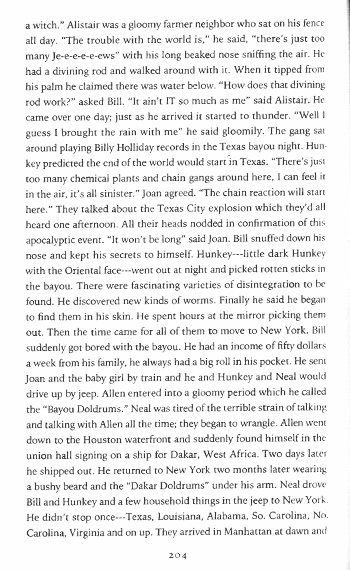 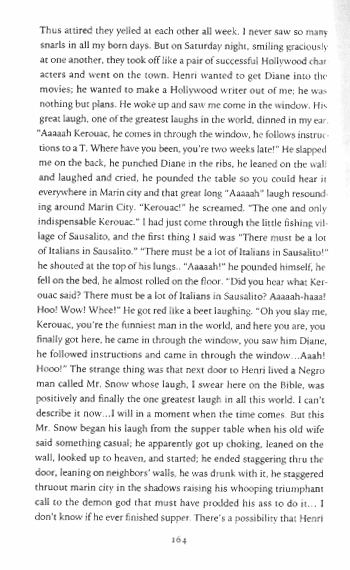 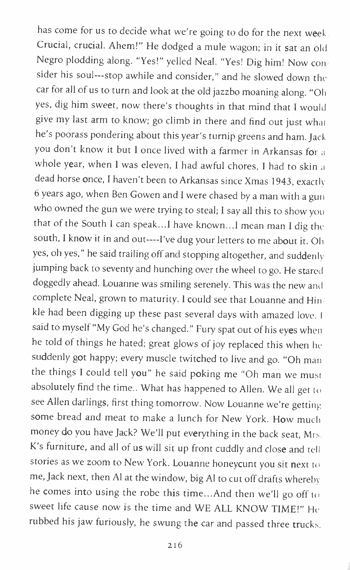 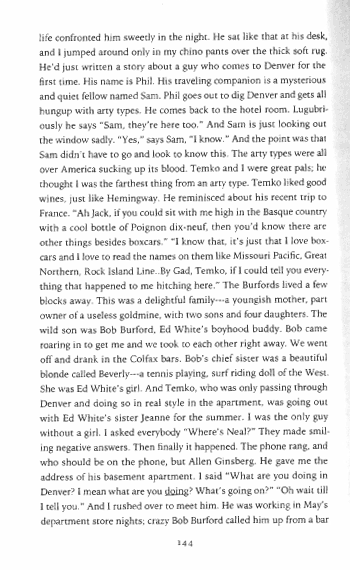 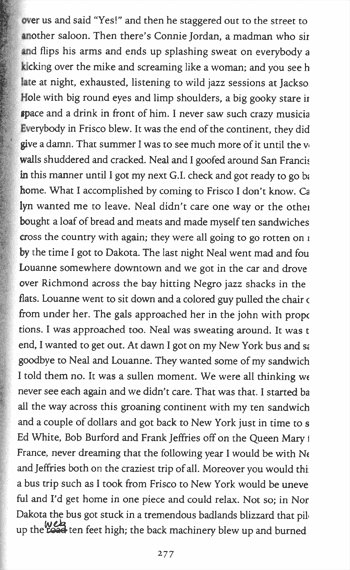 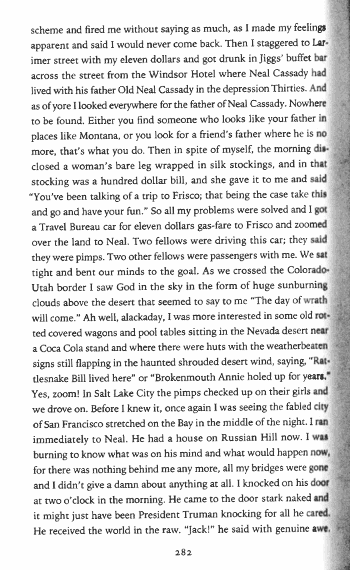 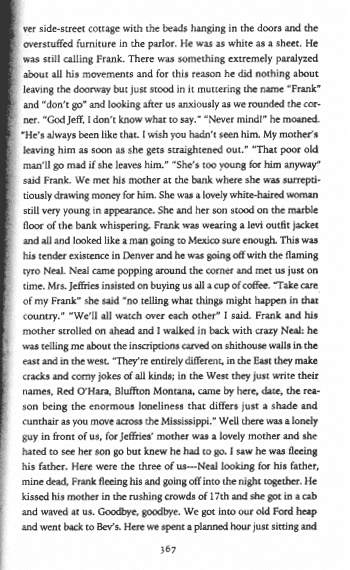 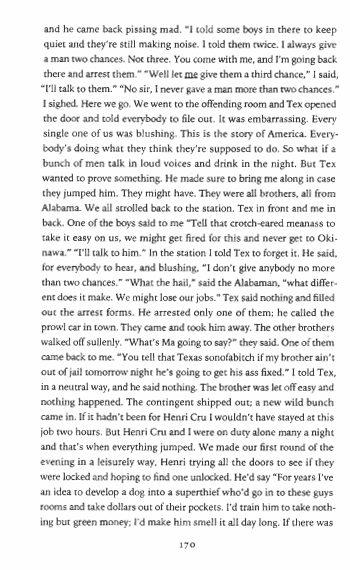 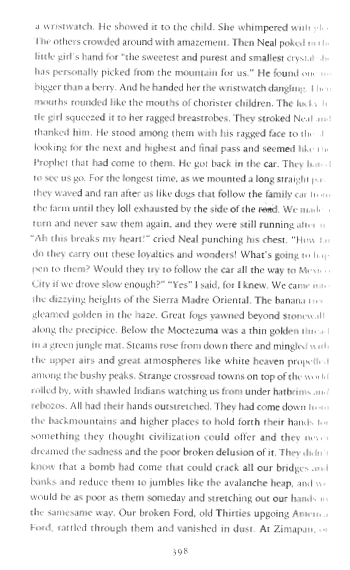 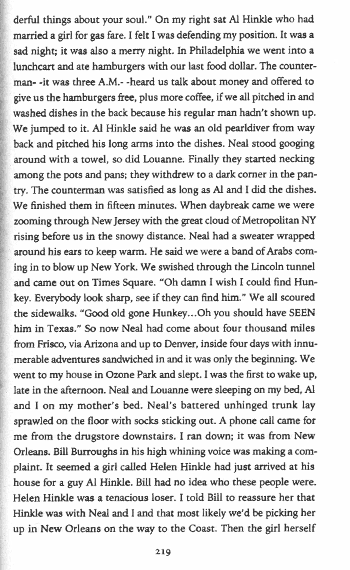 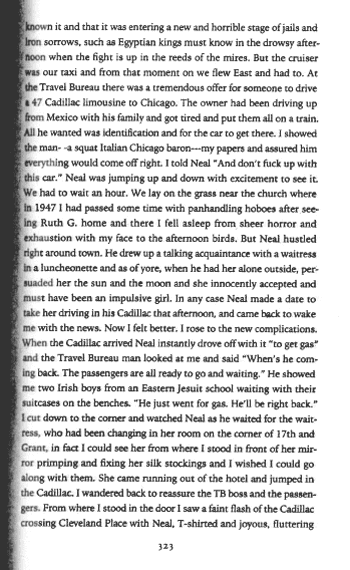 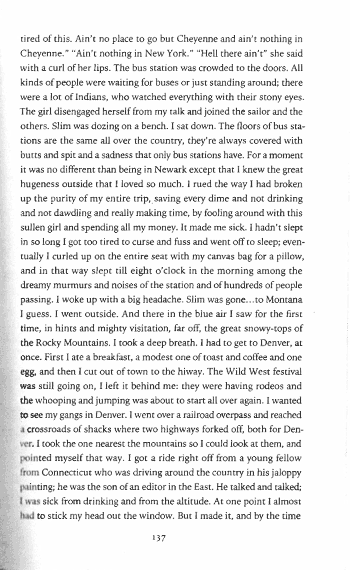 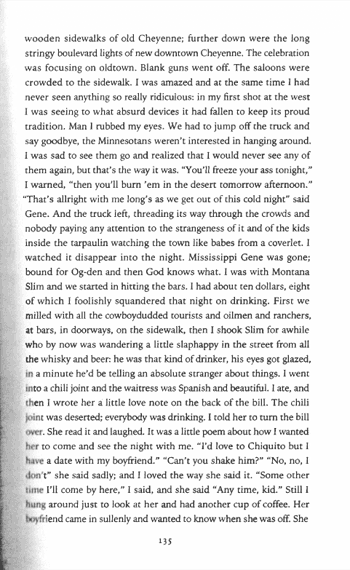 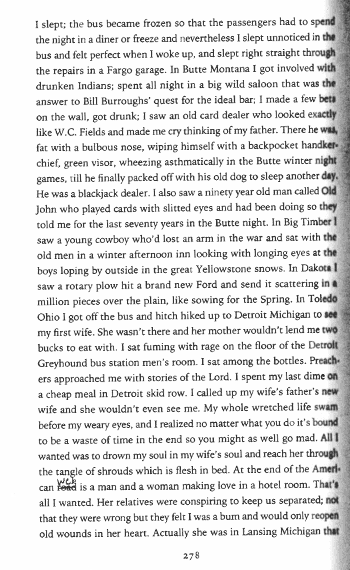 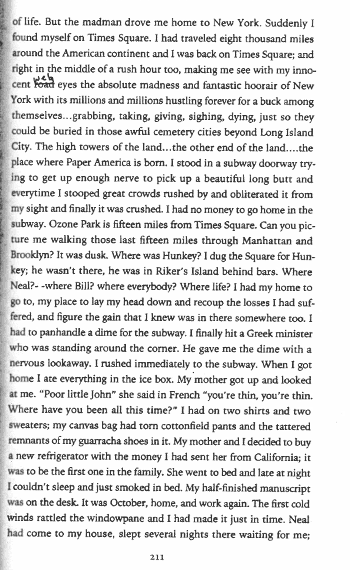 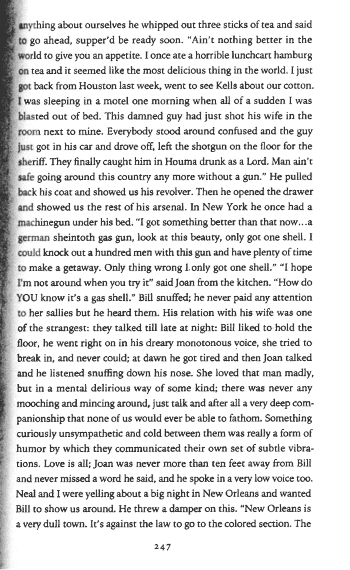 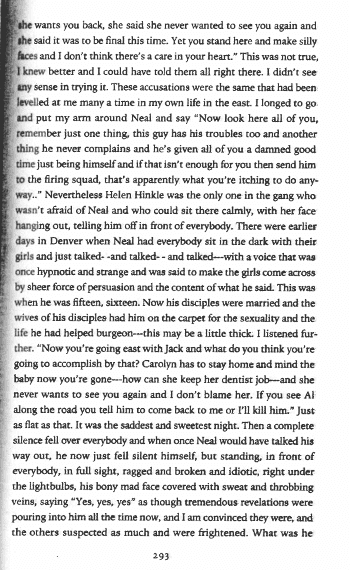 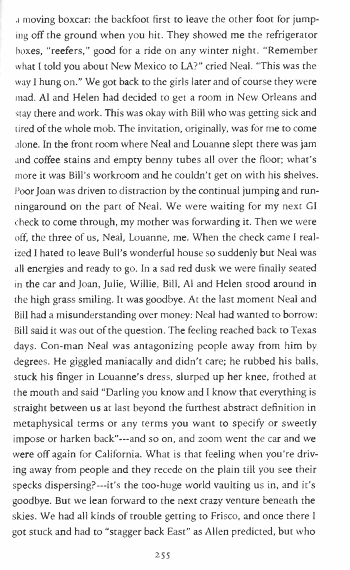 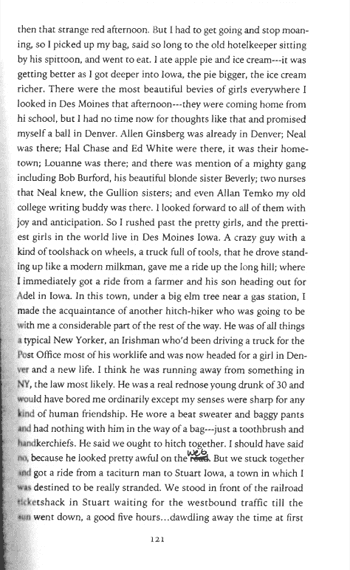 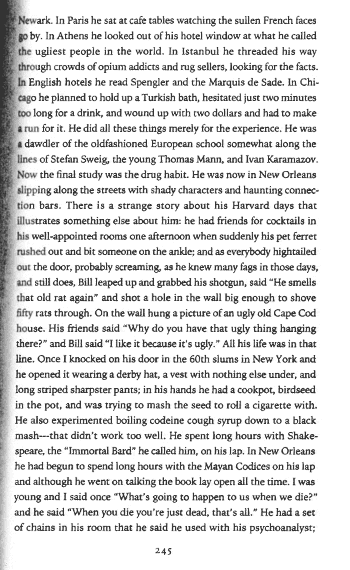 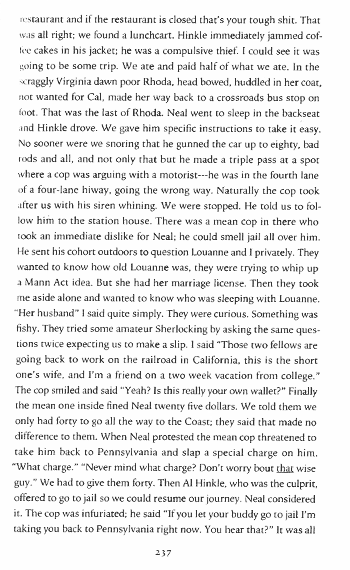 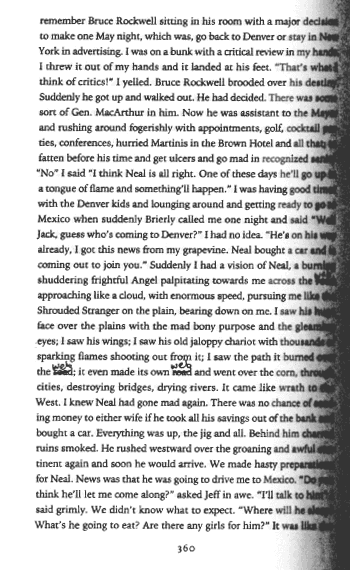 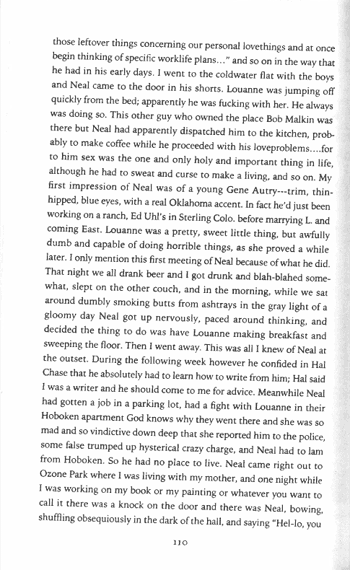 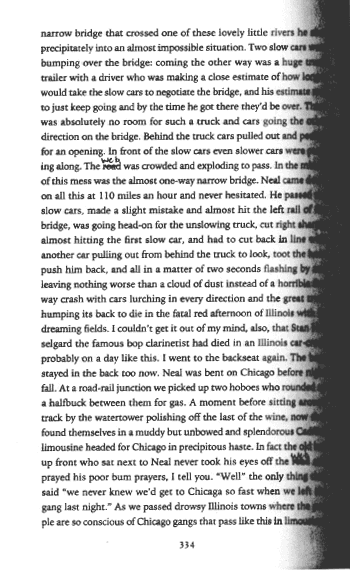 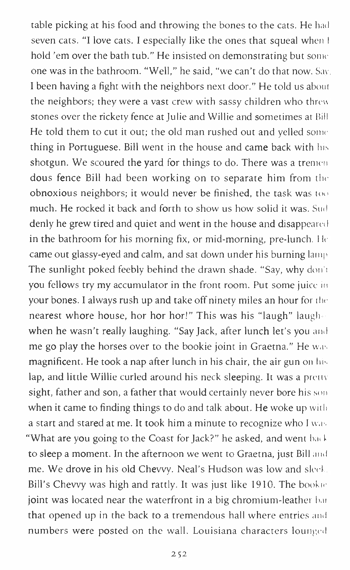 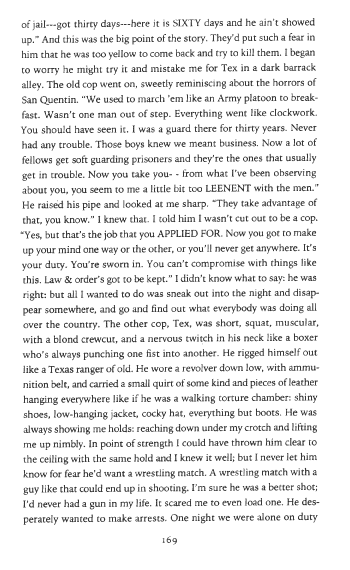 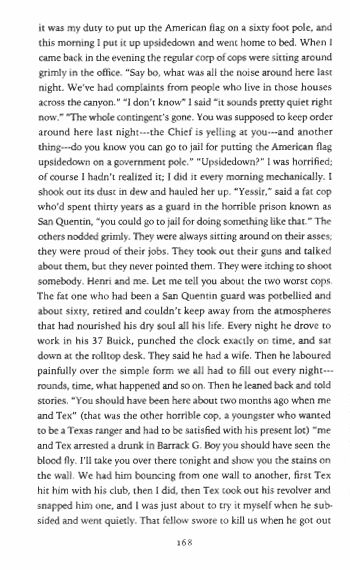 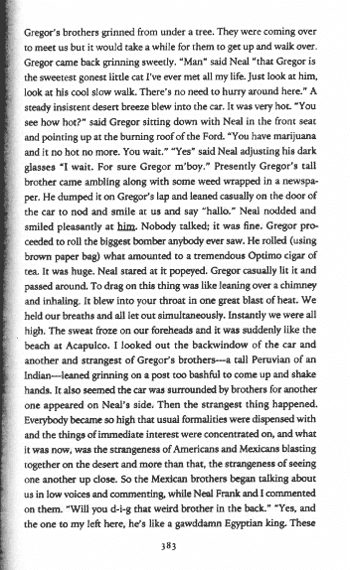 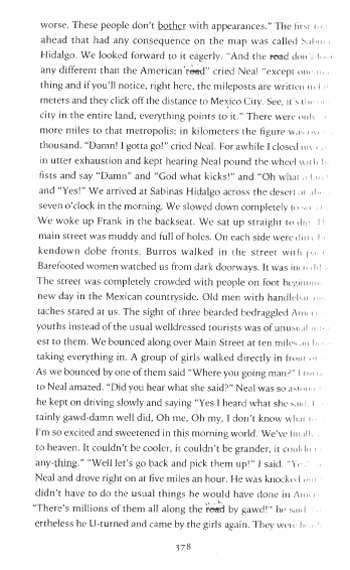 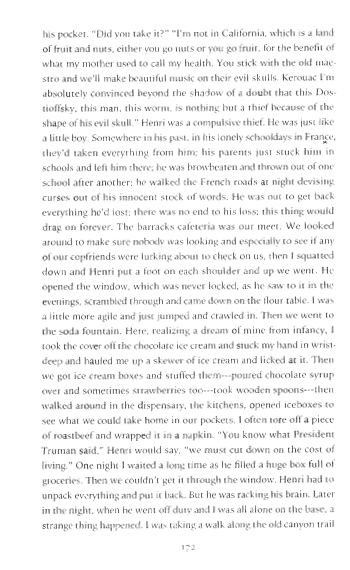 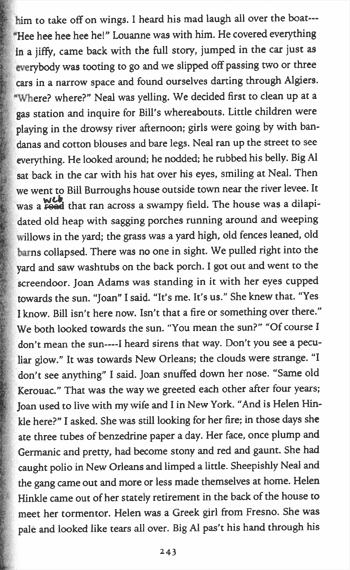 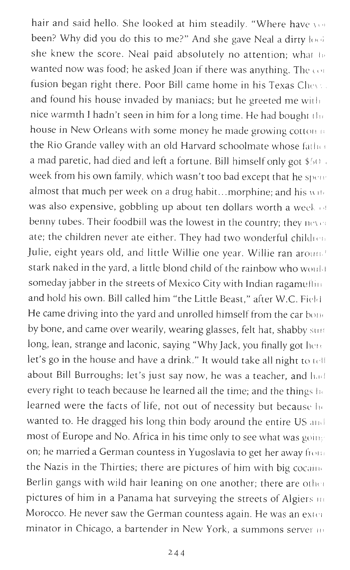 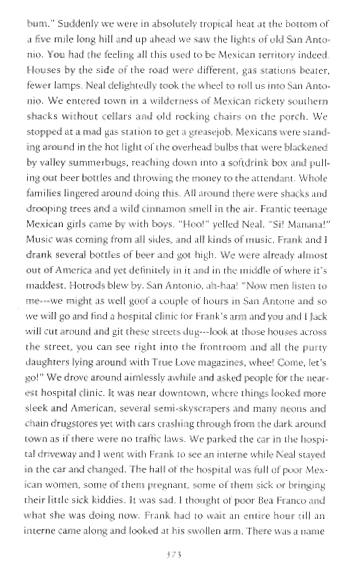 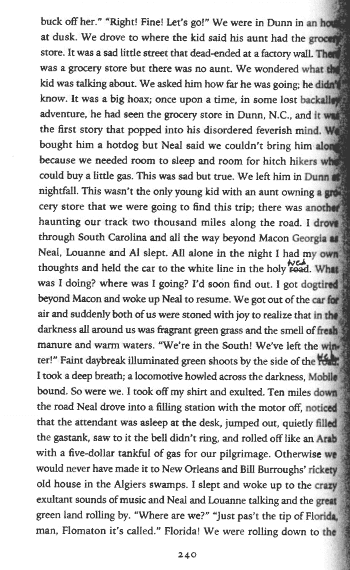 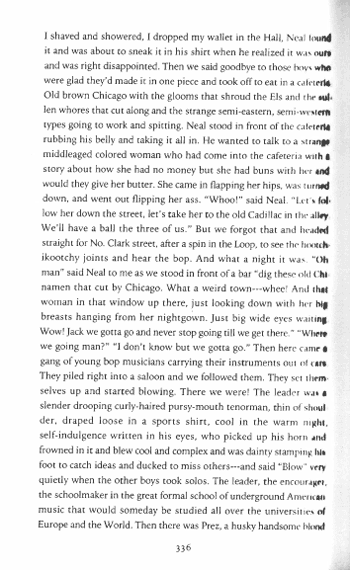 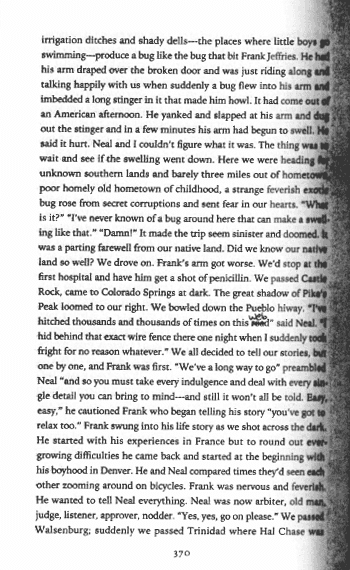 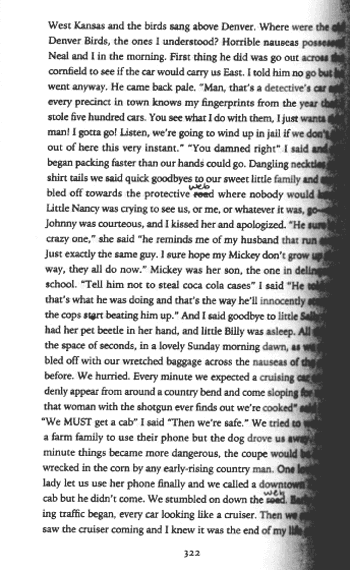 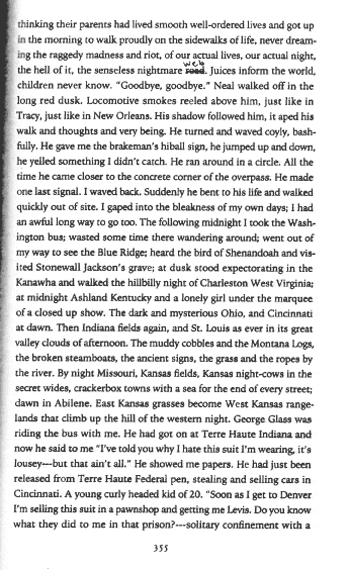 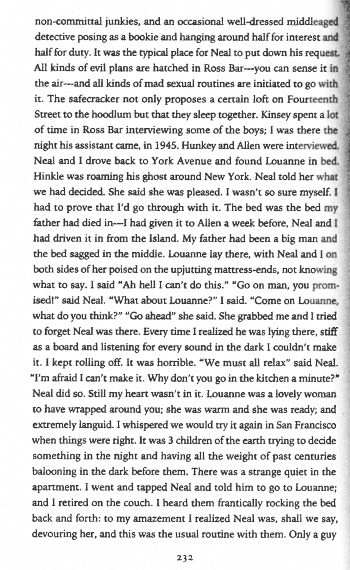 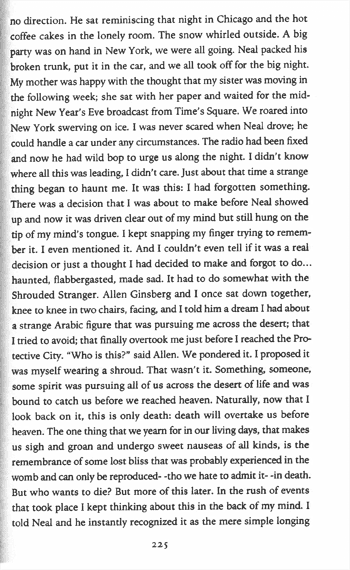 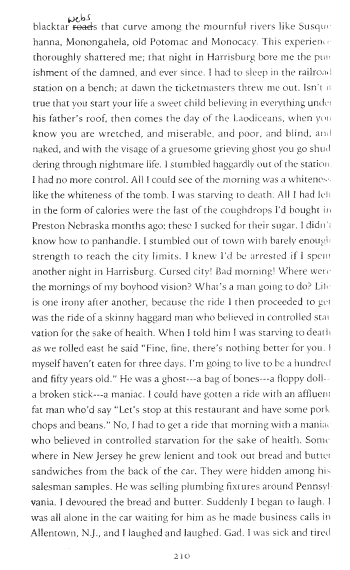 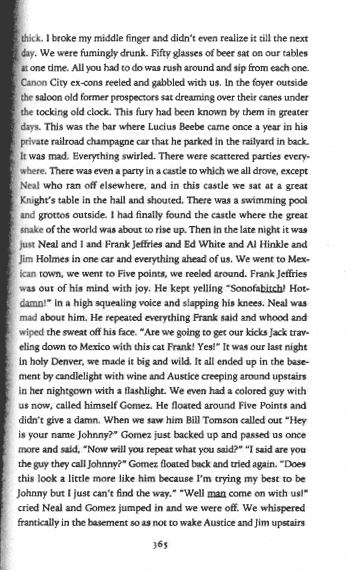 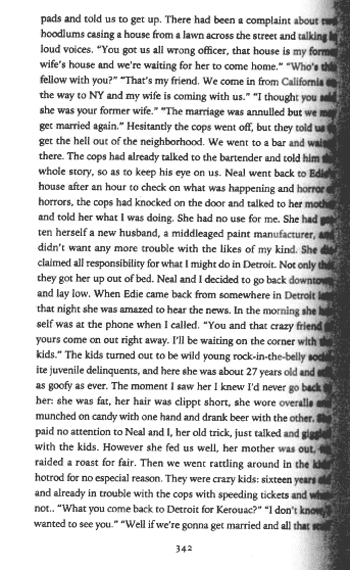 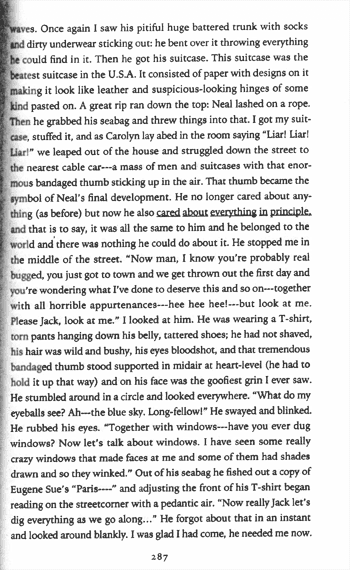 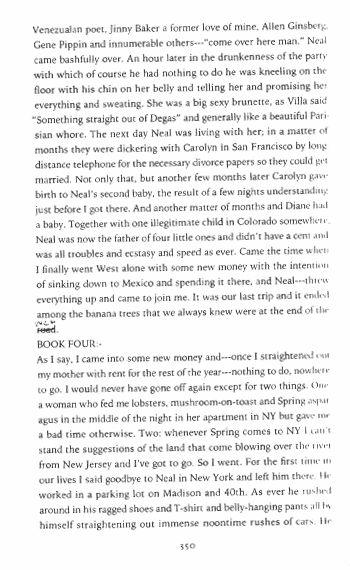 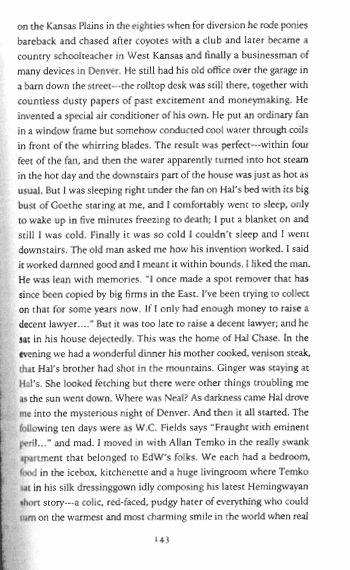 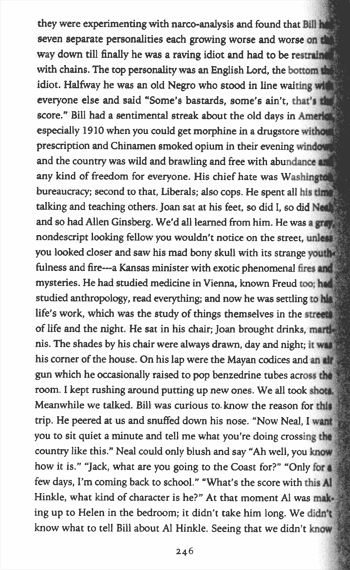 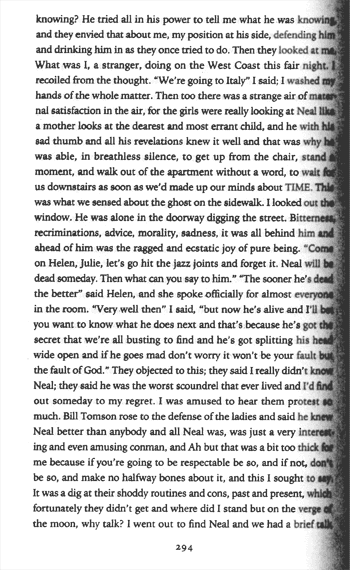 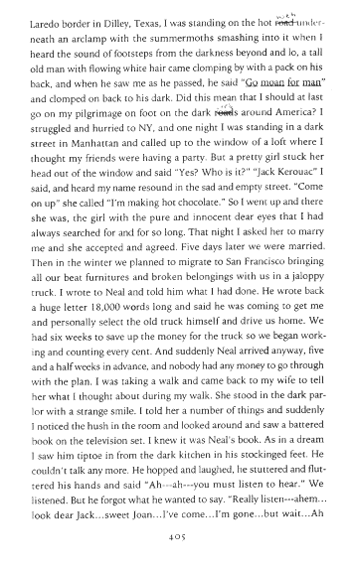 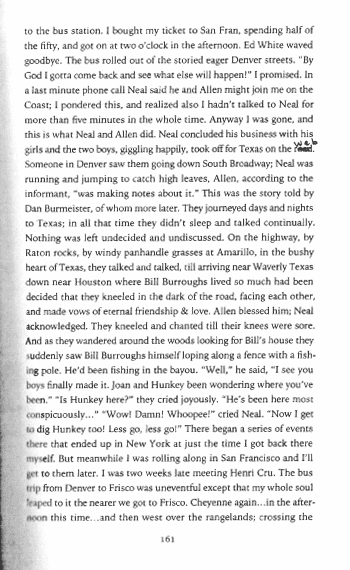 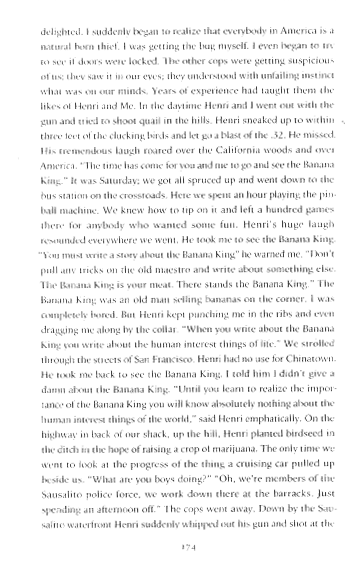 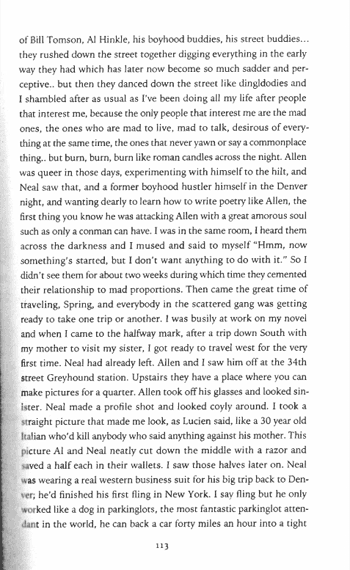 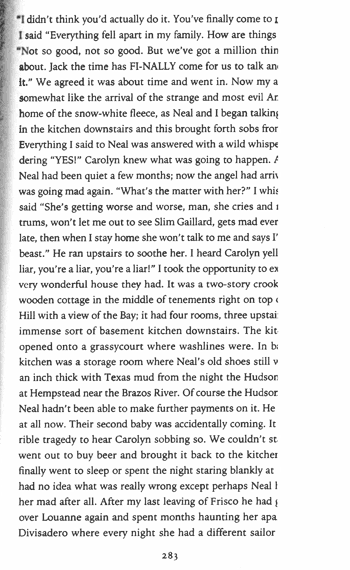 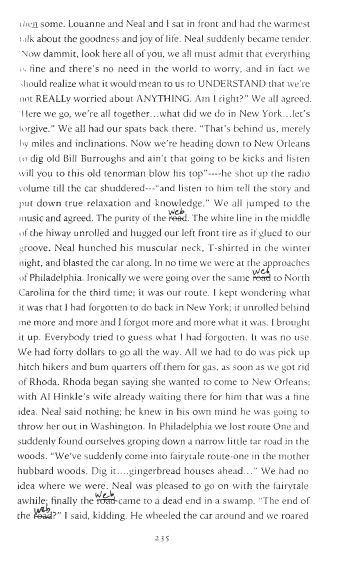 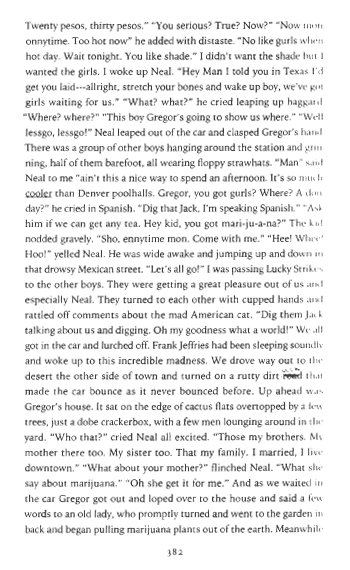 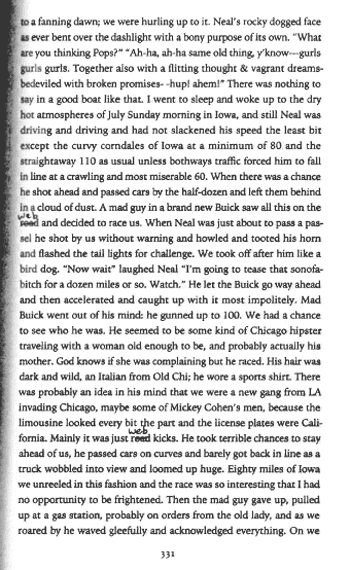 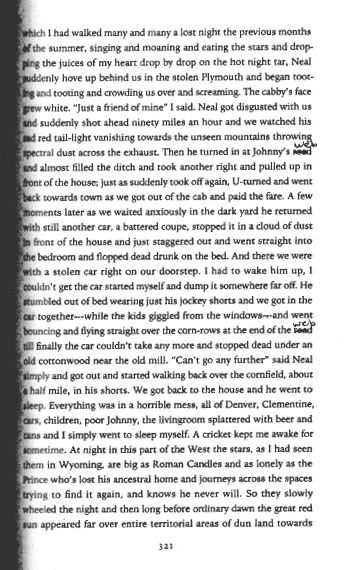 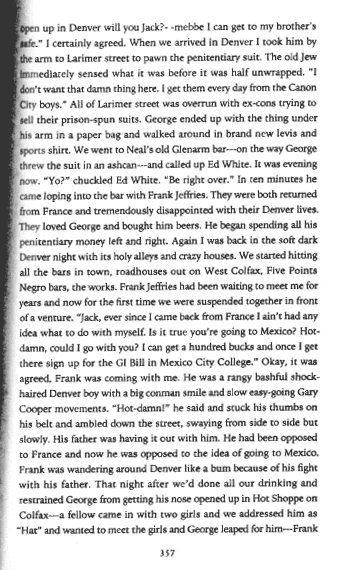 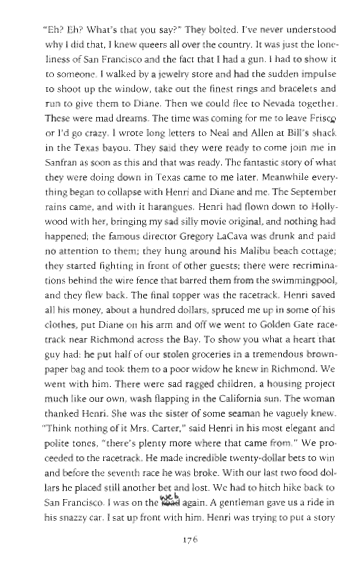 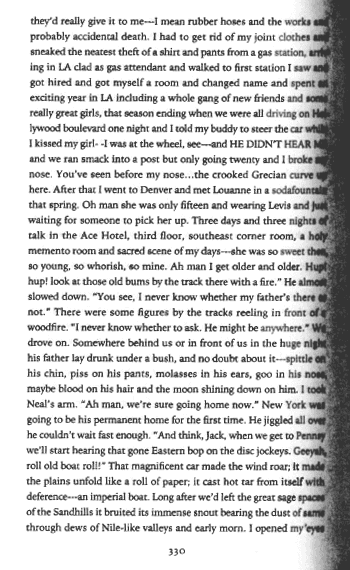 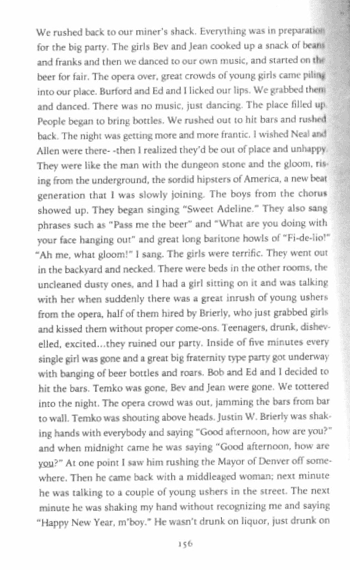 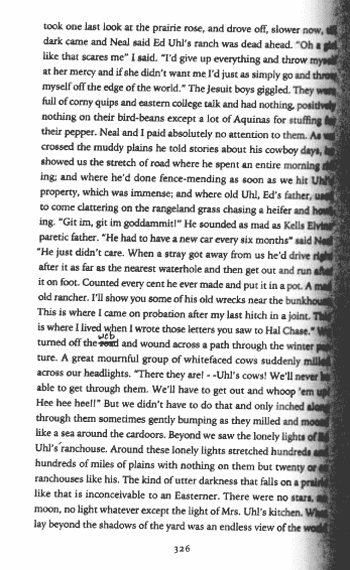 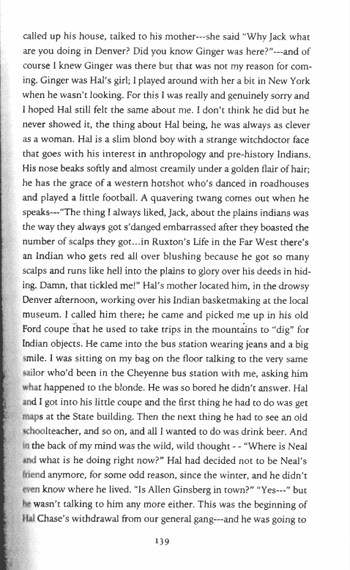 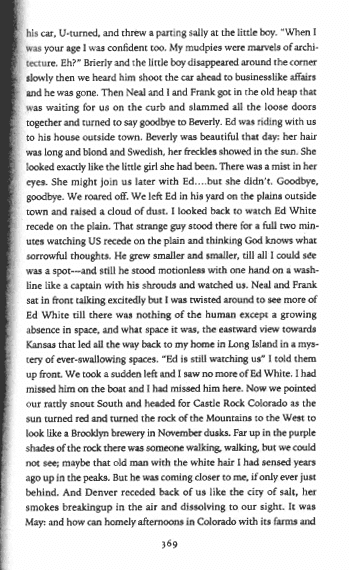 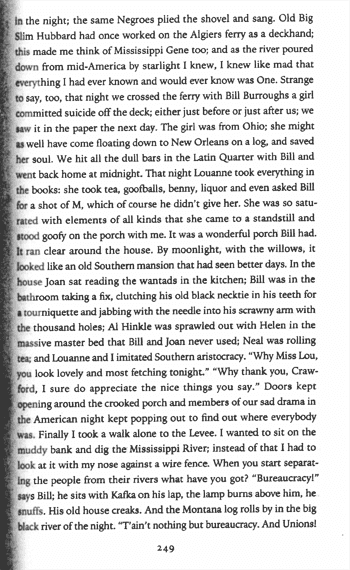 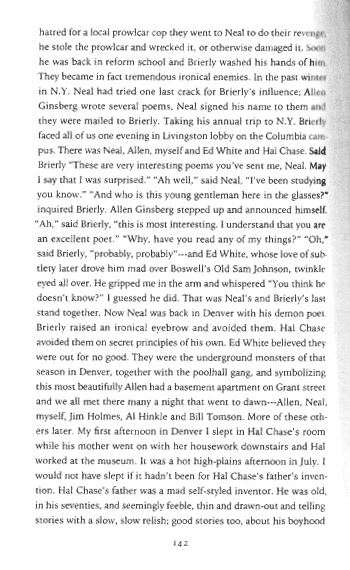 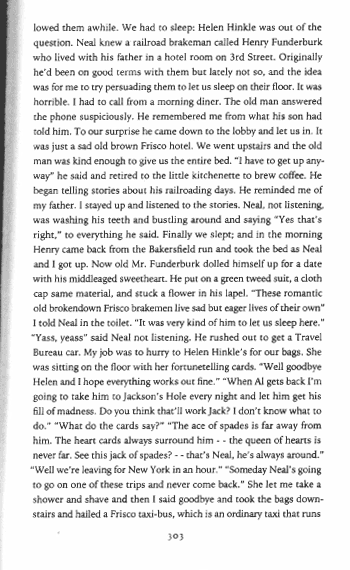 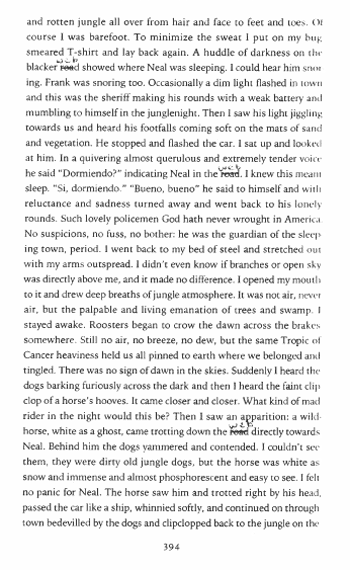 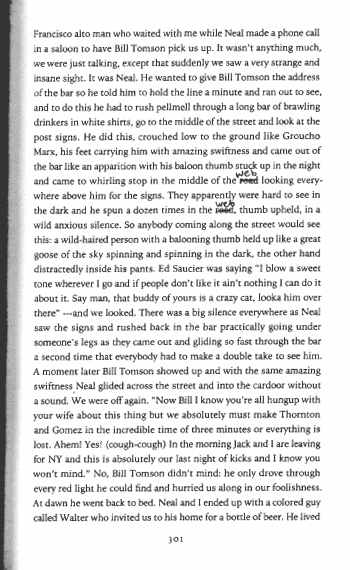 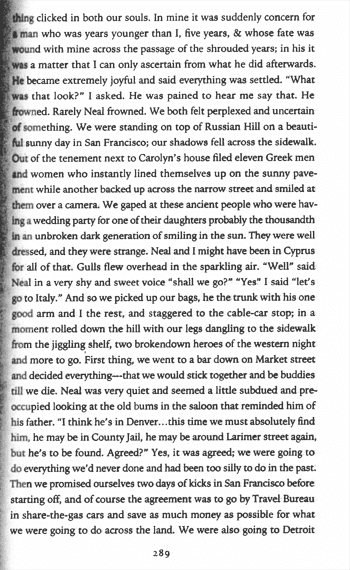 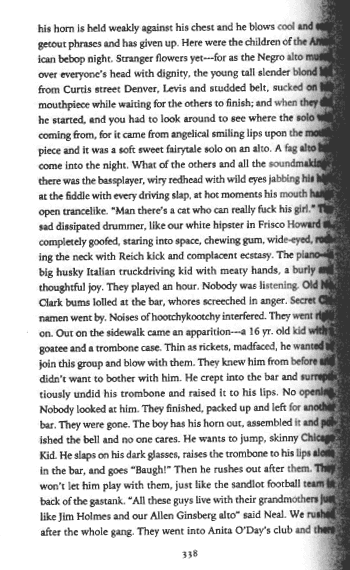 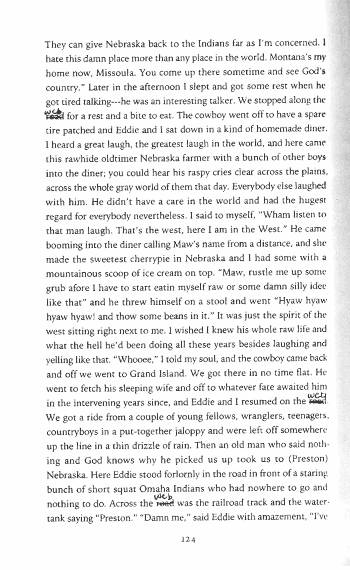 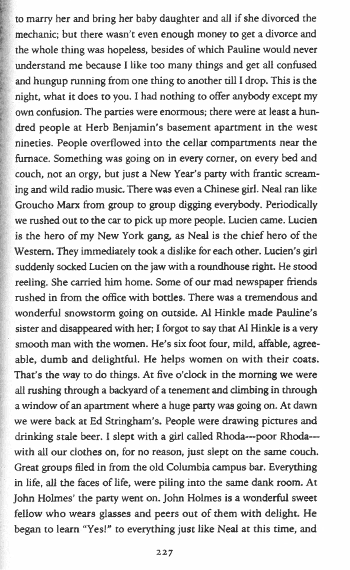 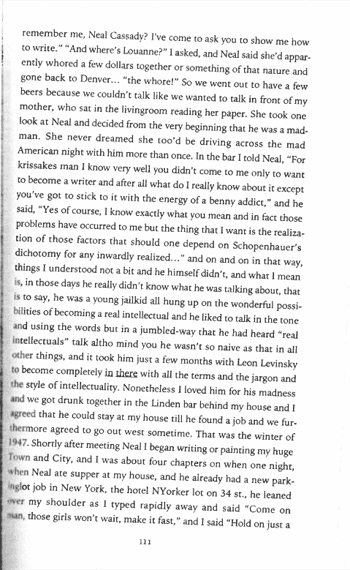 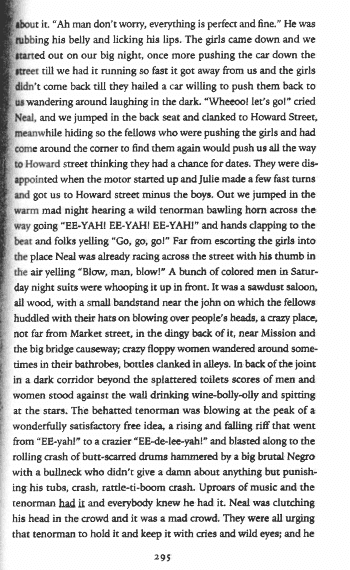 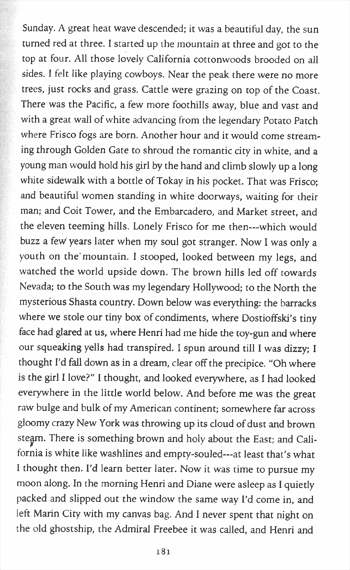 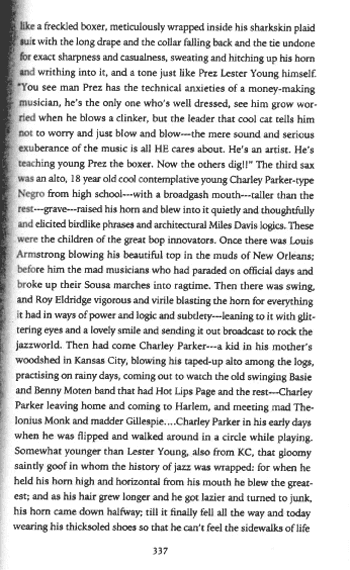 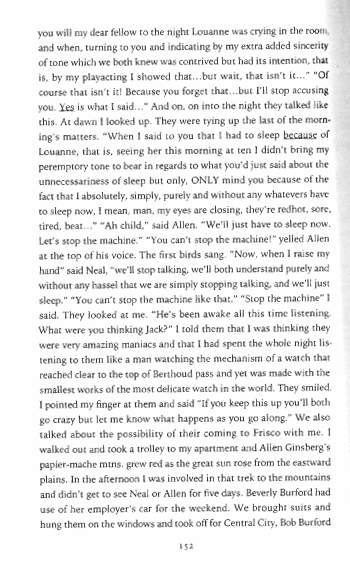 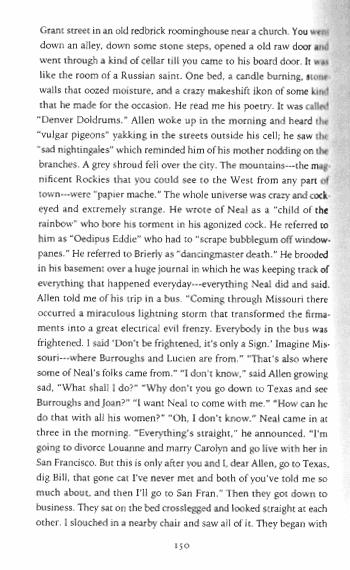 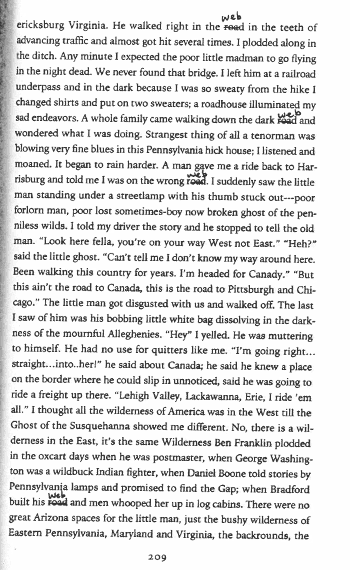 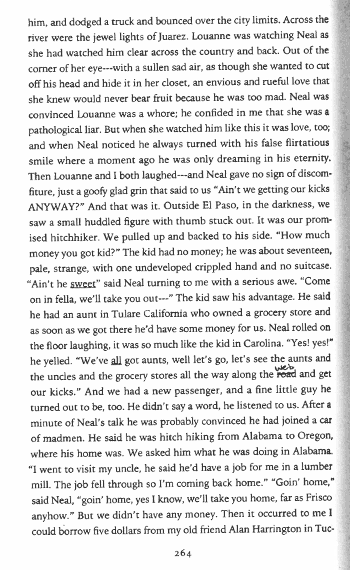 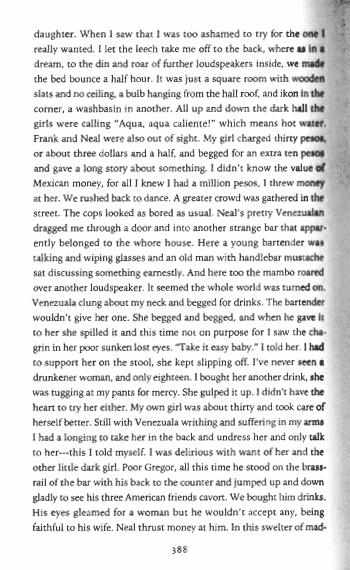 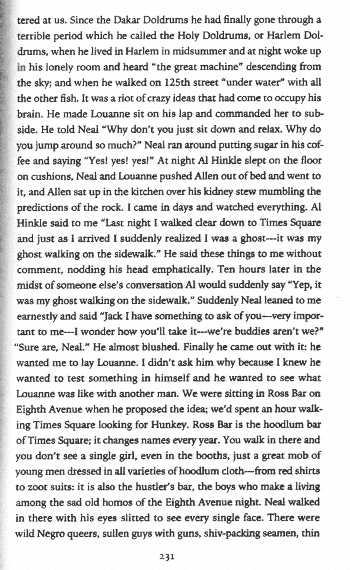 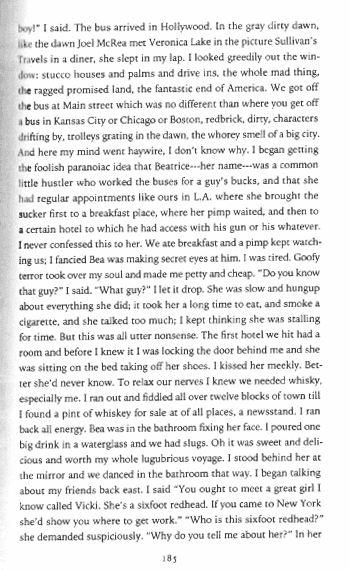 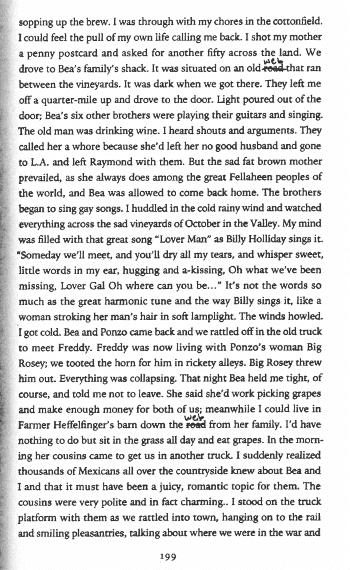 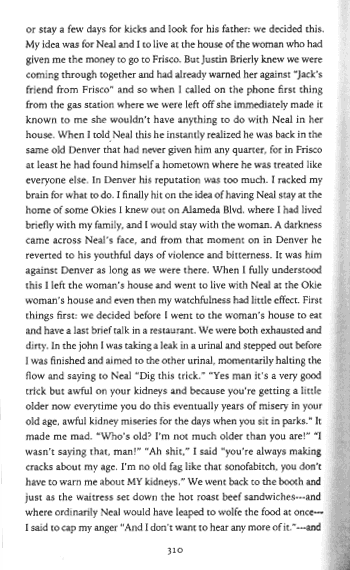 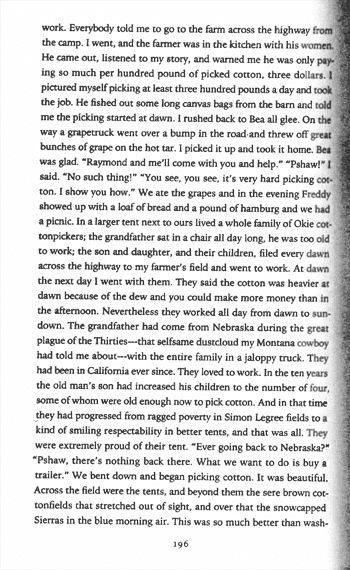 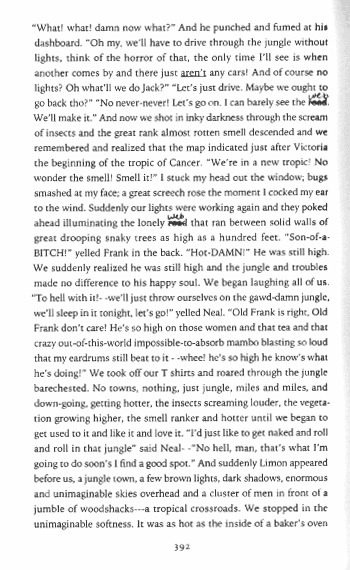 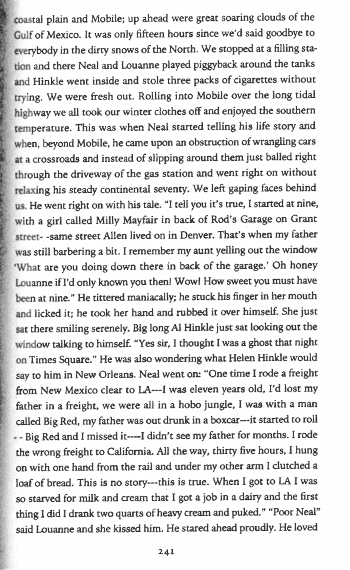 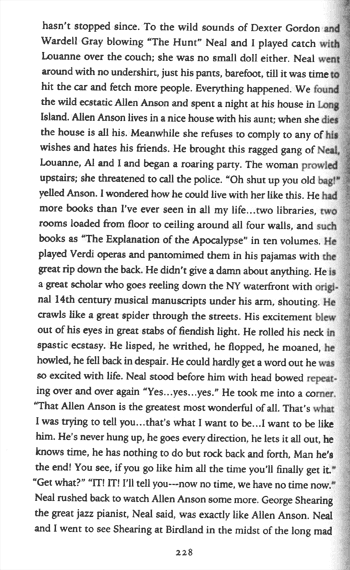 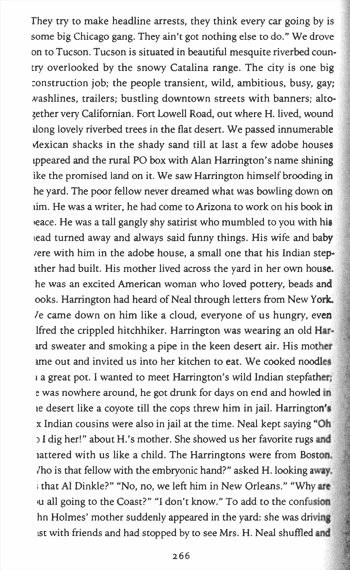 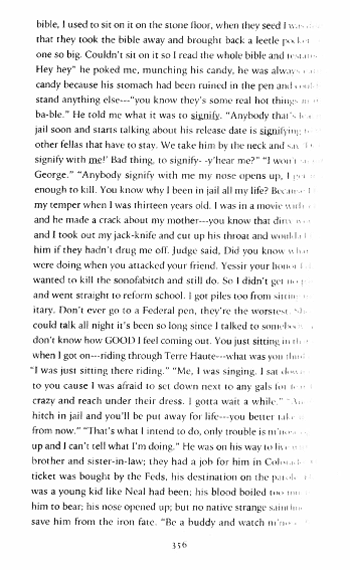 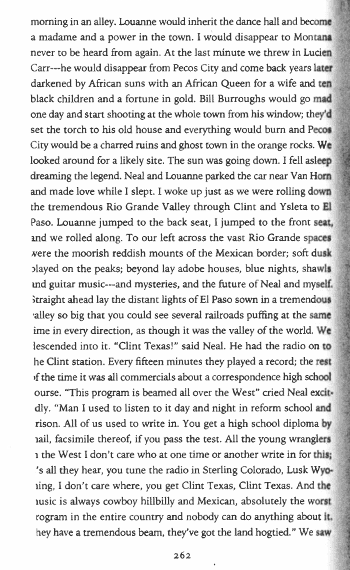 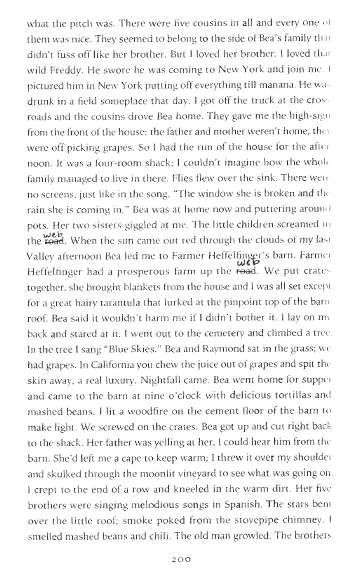 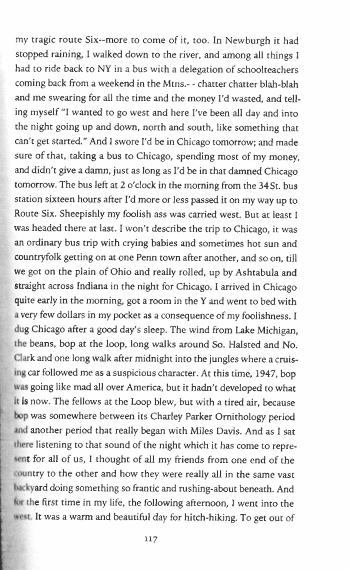 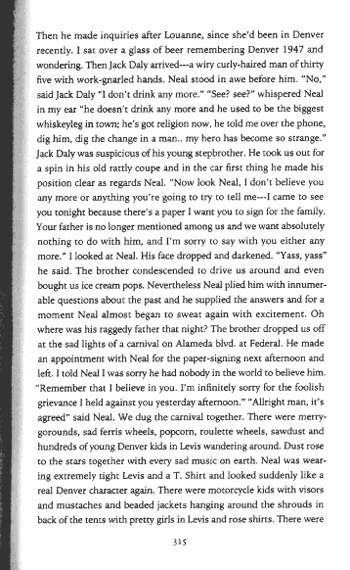 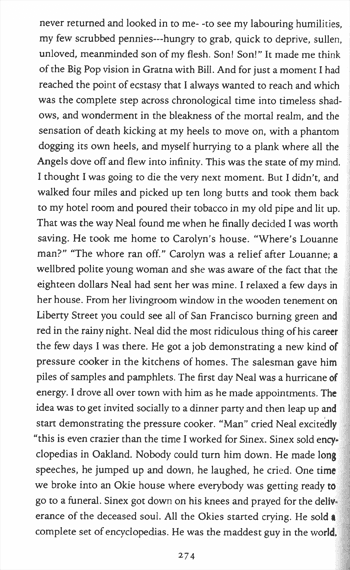 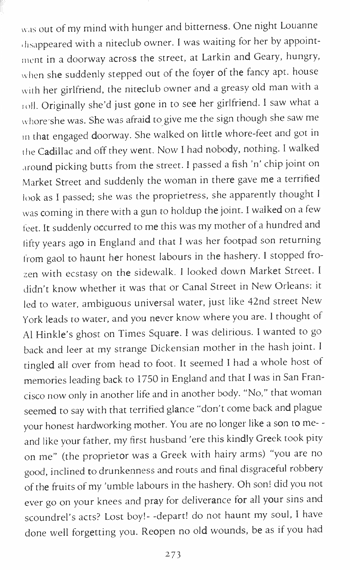 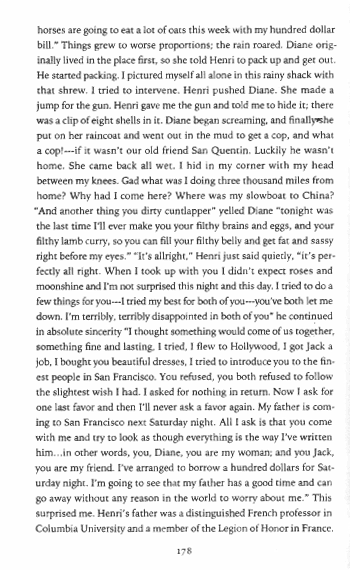 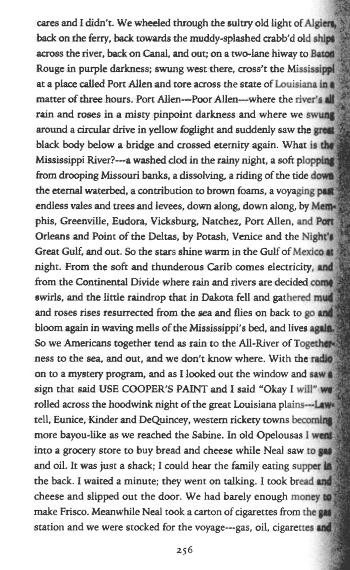 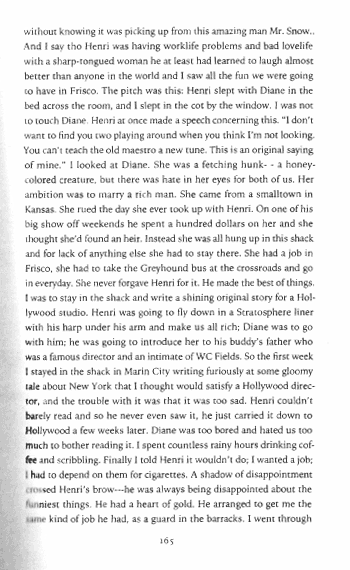 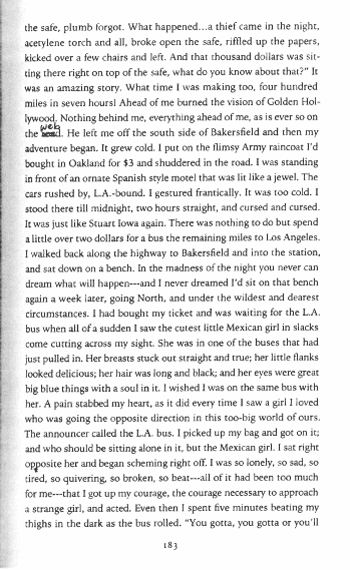 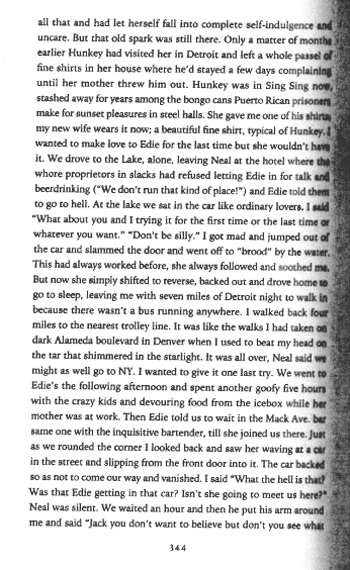 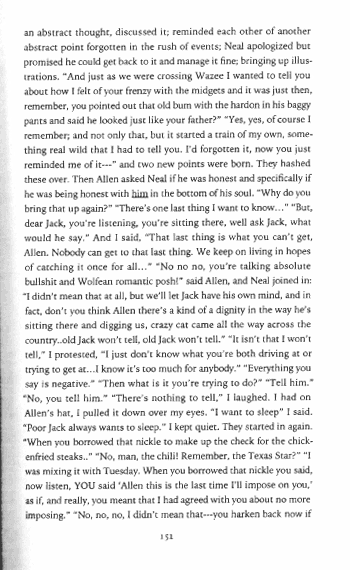 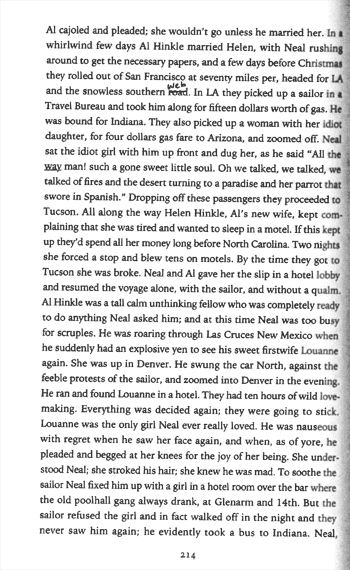 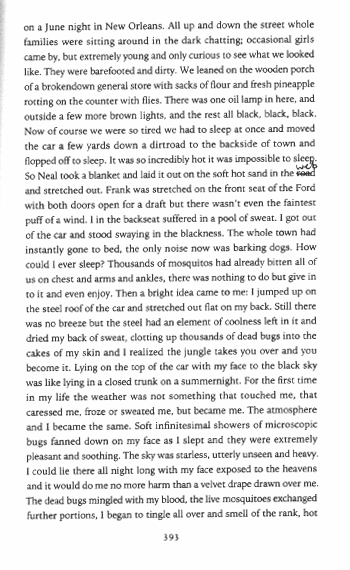 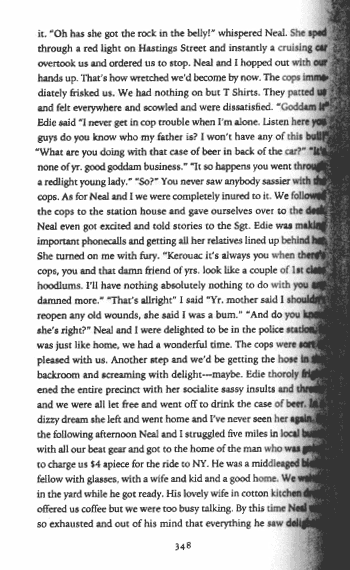 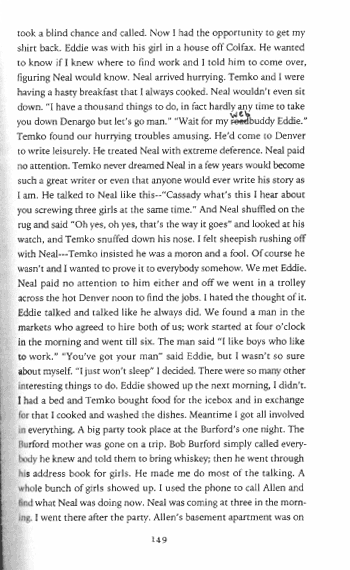 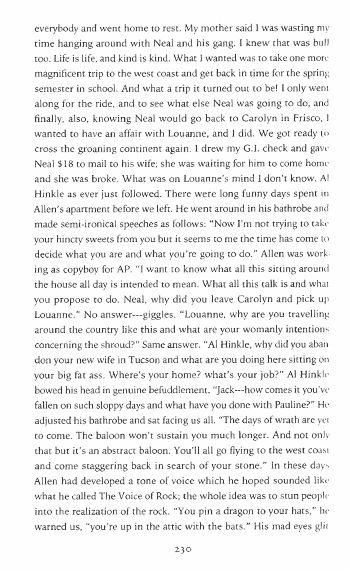 Readers can also skim through the book for the word “web” to test its integration into Kerouac’s 1957 context by clicking on the last occurrence of the word on any page where it is found. 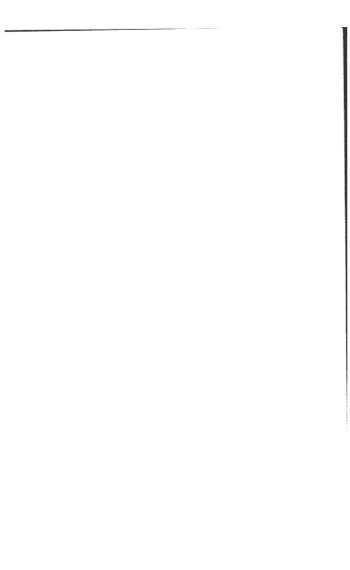 Note: In regards to using the click feature, be sure to scroll so that “web” appears near the center of the browser before clicking. 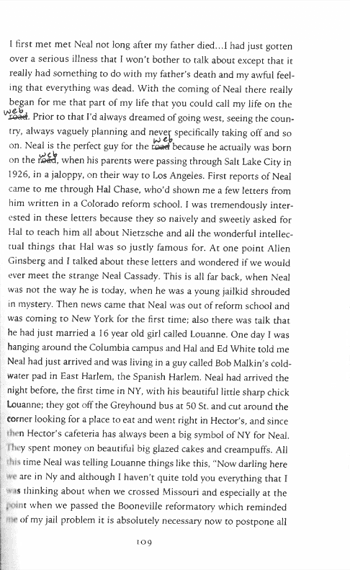 I use the up arrow on my keyboard to nudge the word “web” down the page if it is necessary. 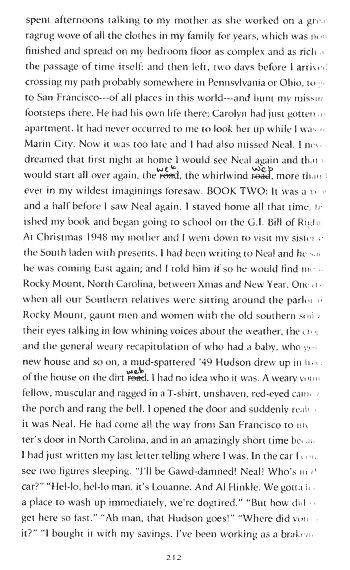 Alternatively, you can use the Tab key to click from one page to the next containing "web" in the script. 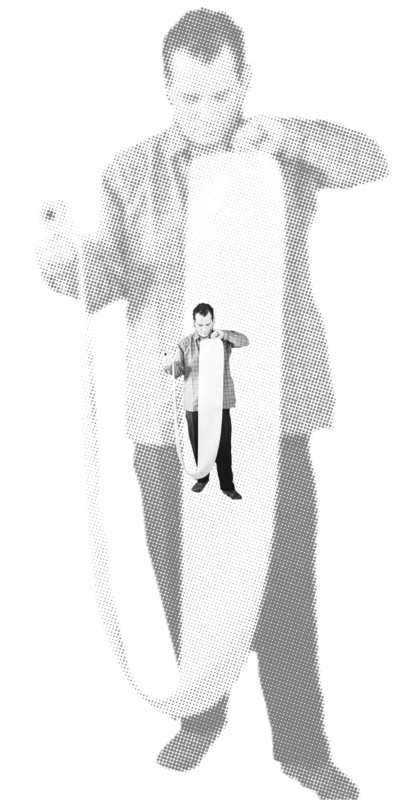 This project was created with the help of TERMINAL, an annual award for net art from Austin Peay State University. 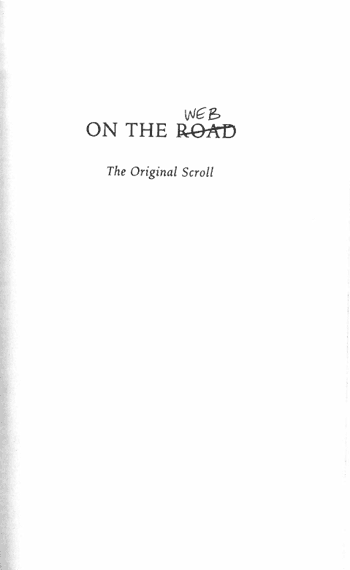 Road picture attributed to Azzazello.